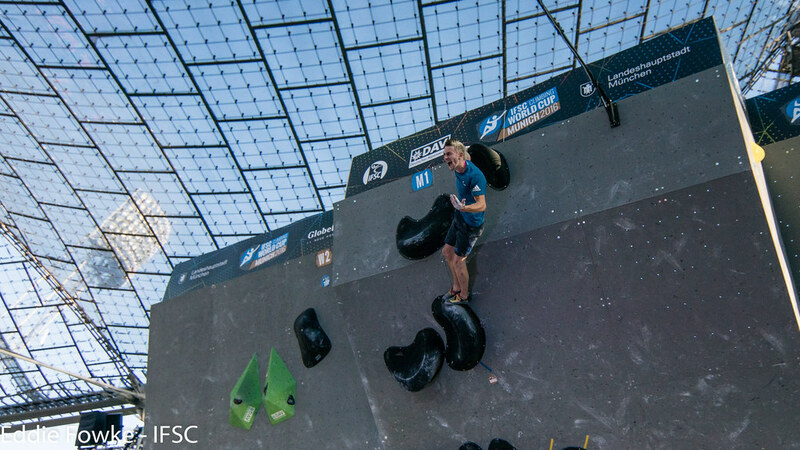 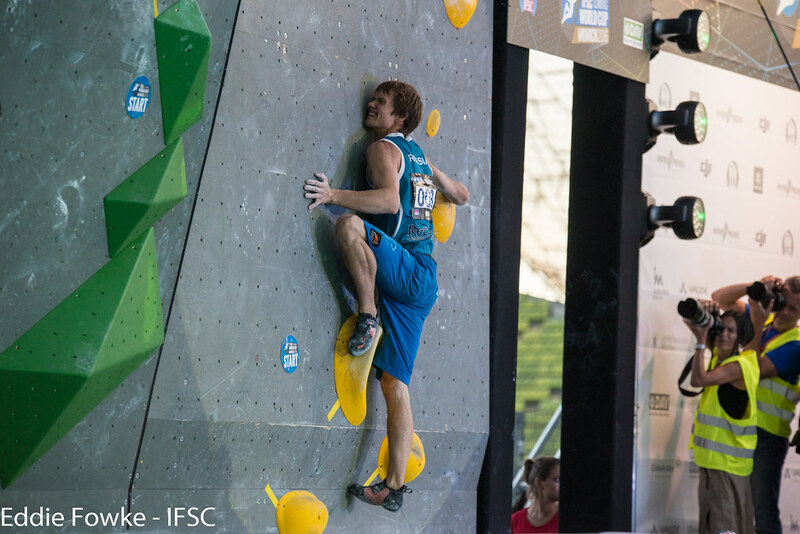 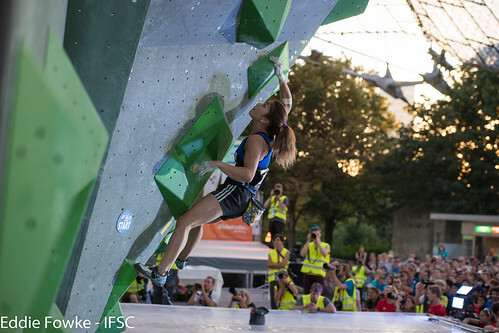 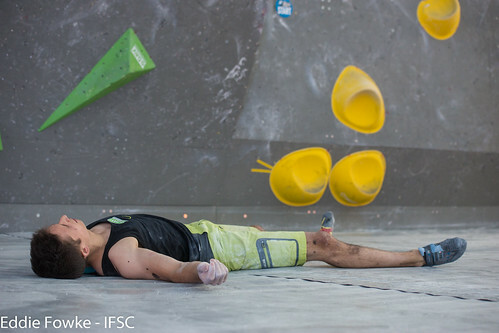 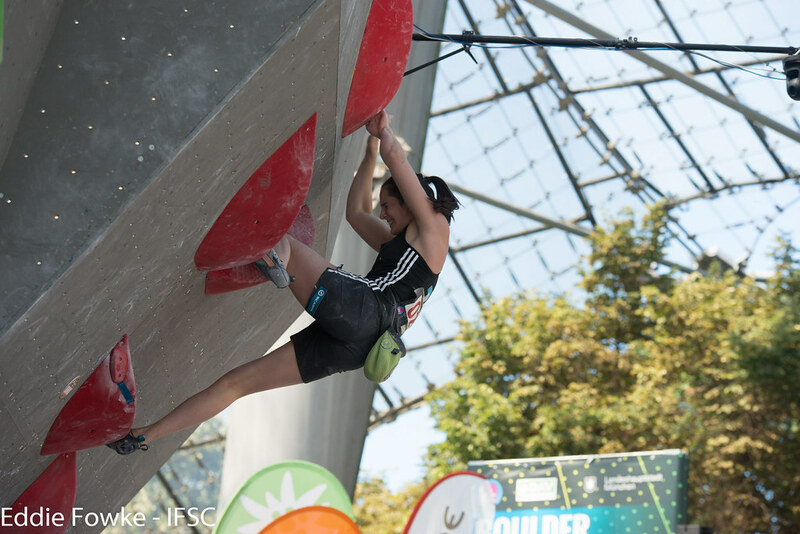 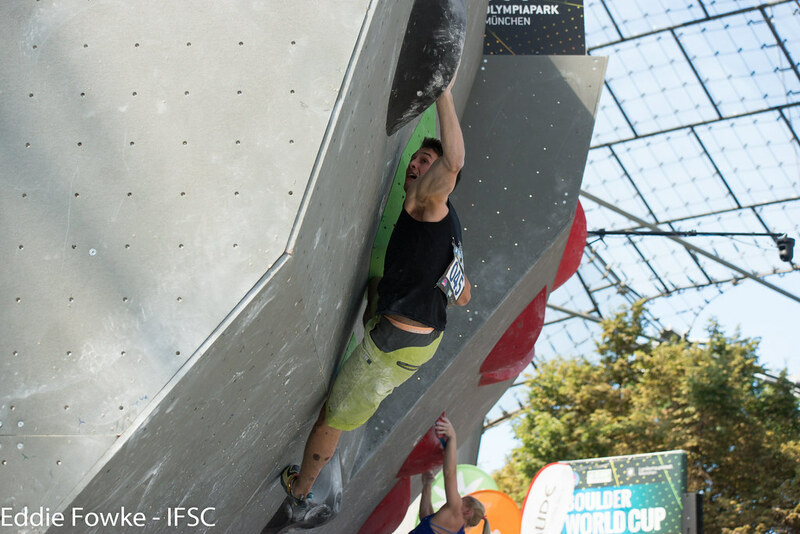 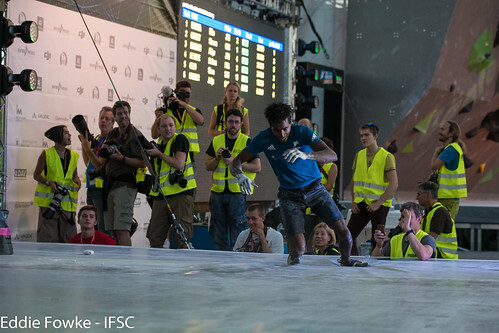 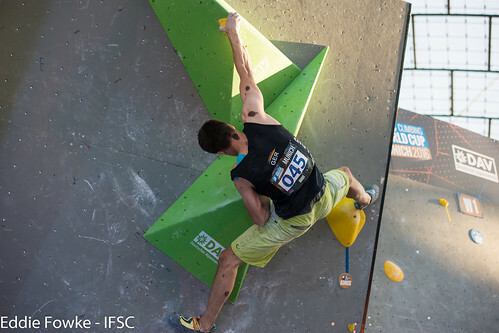 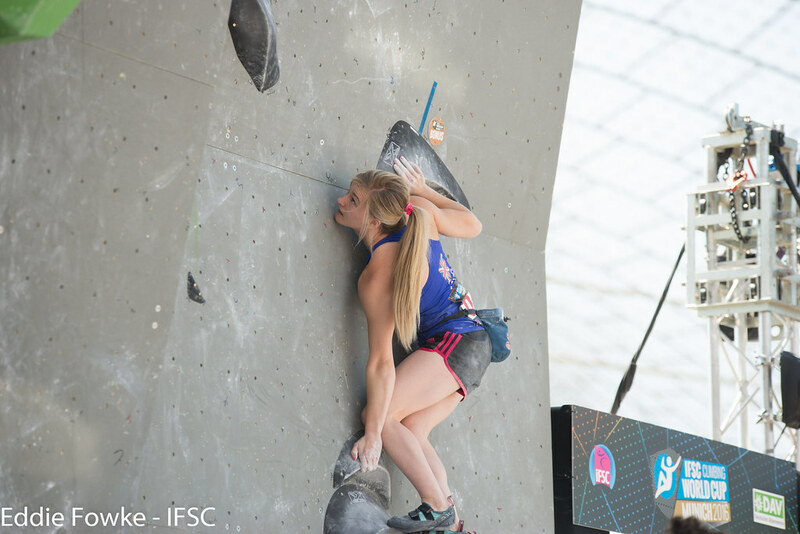 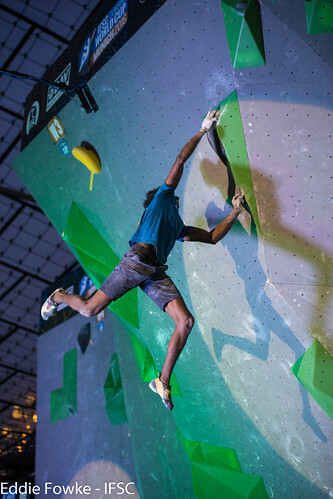 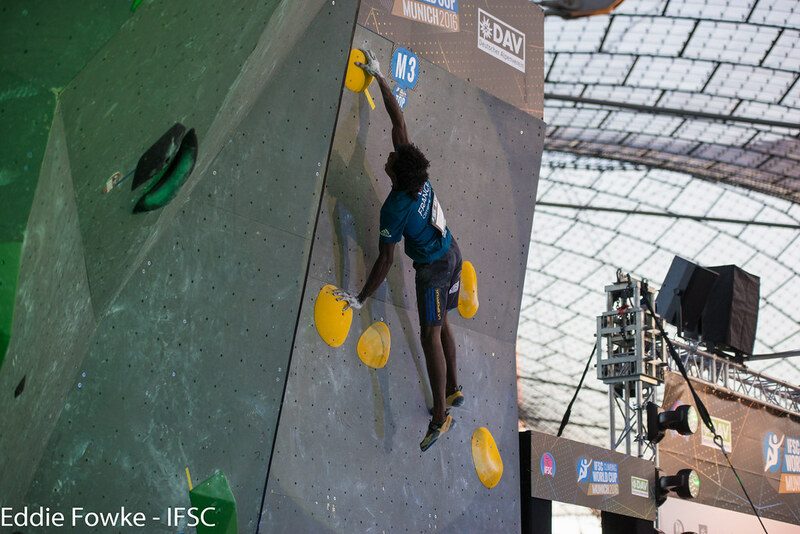 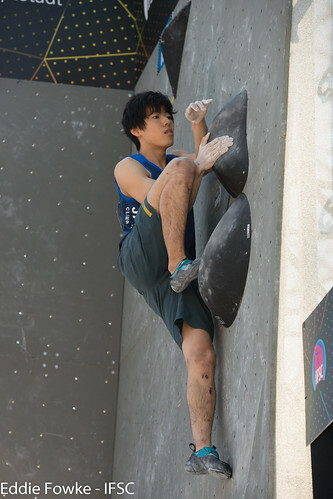 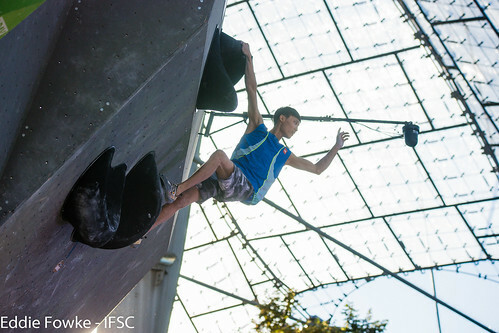 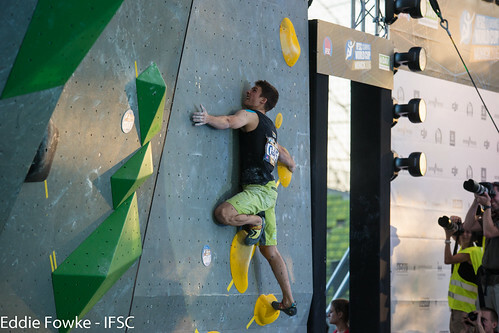 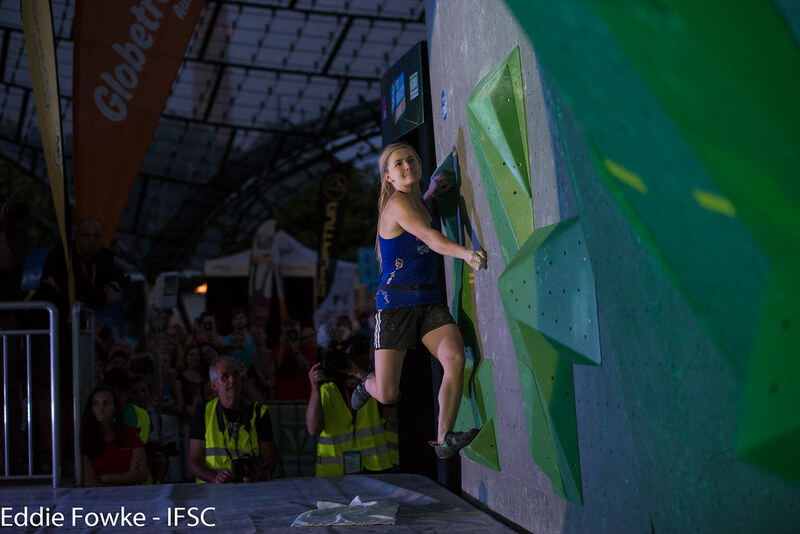 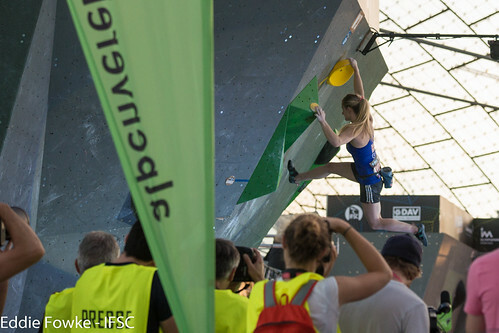 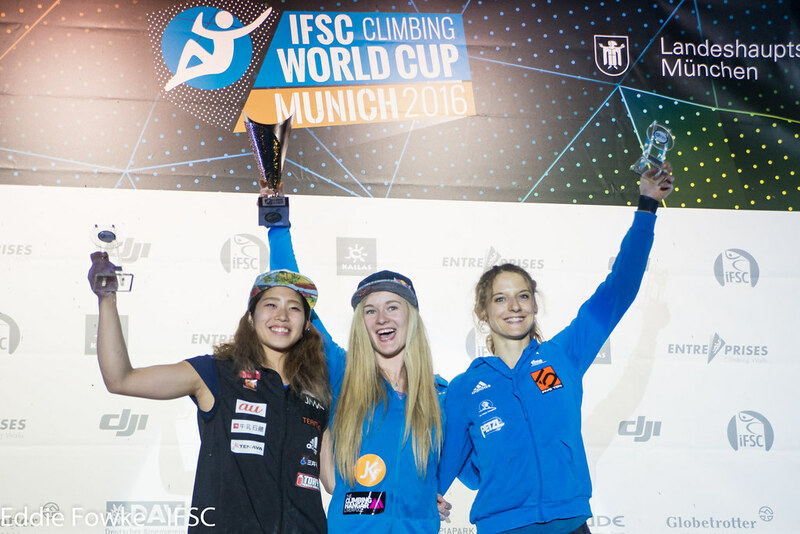 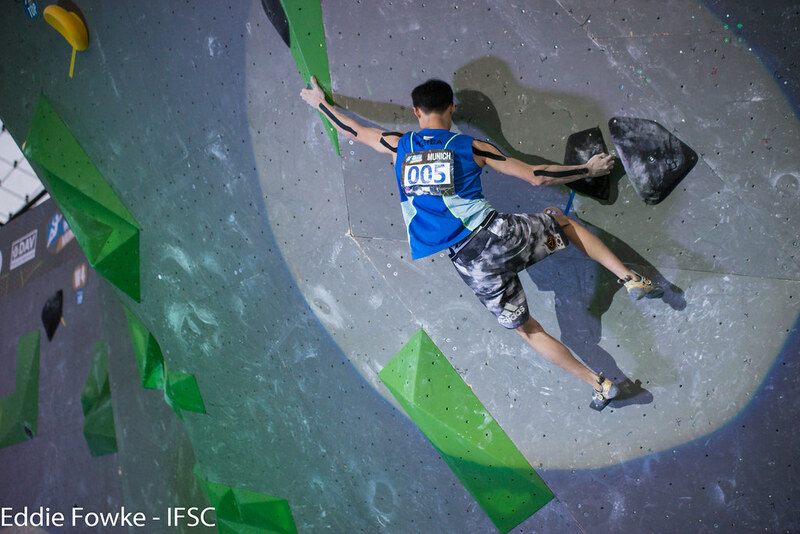 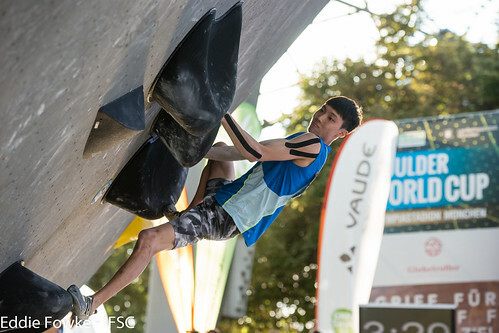 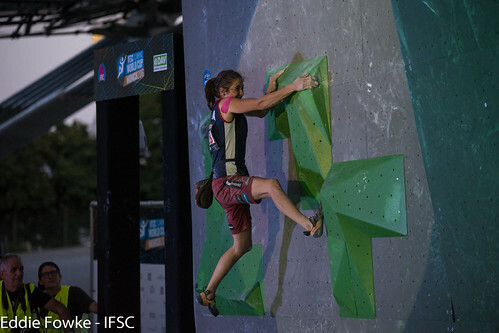 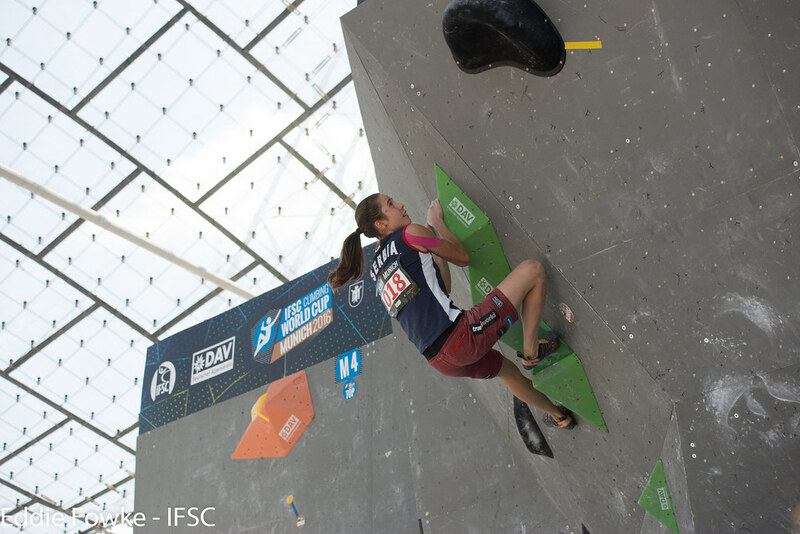 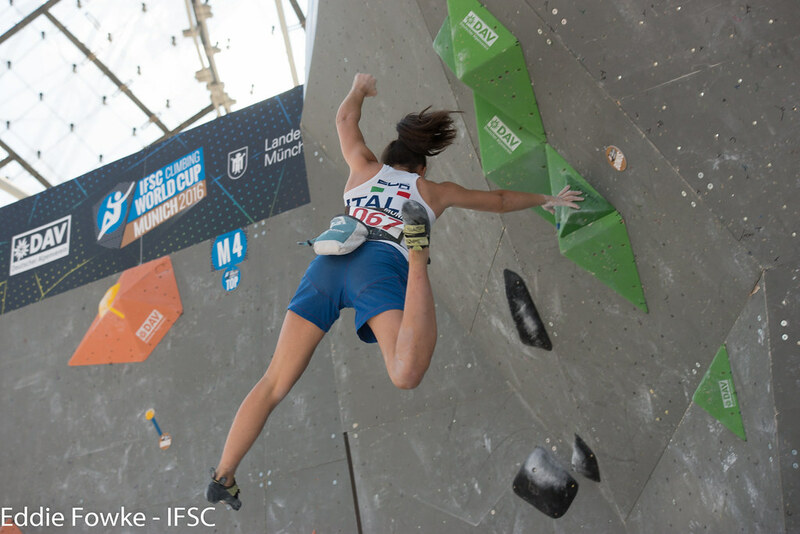 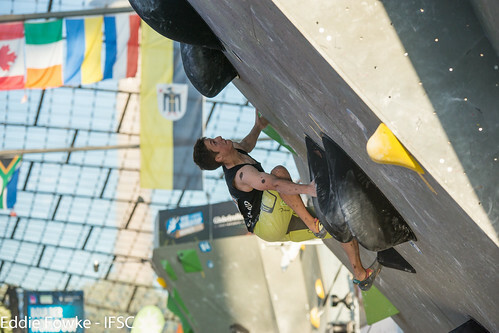 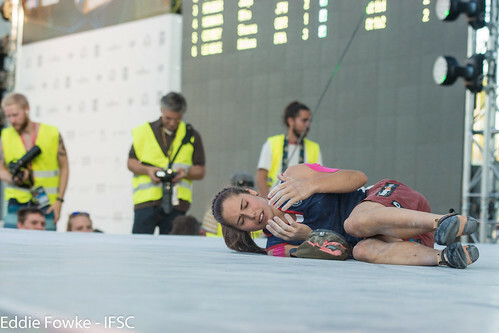 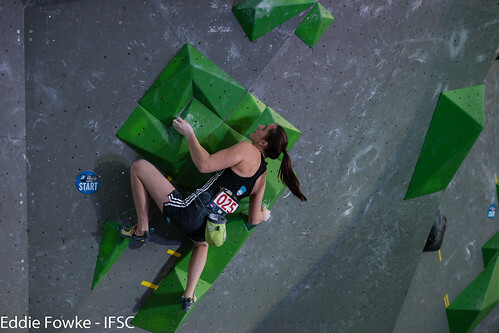 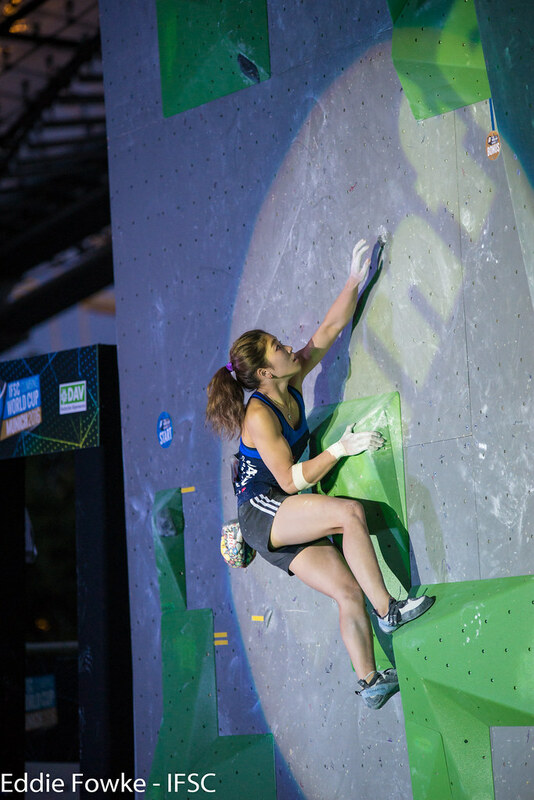 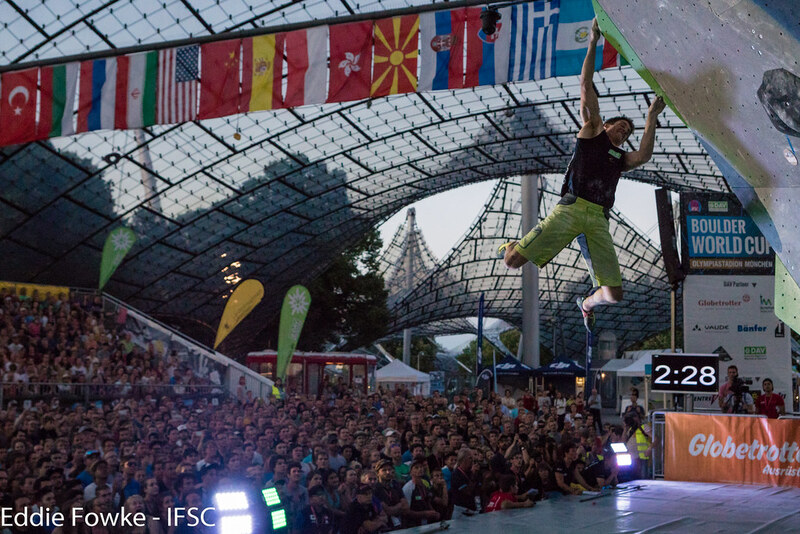 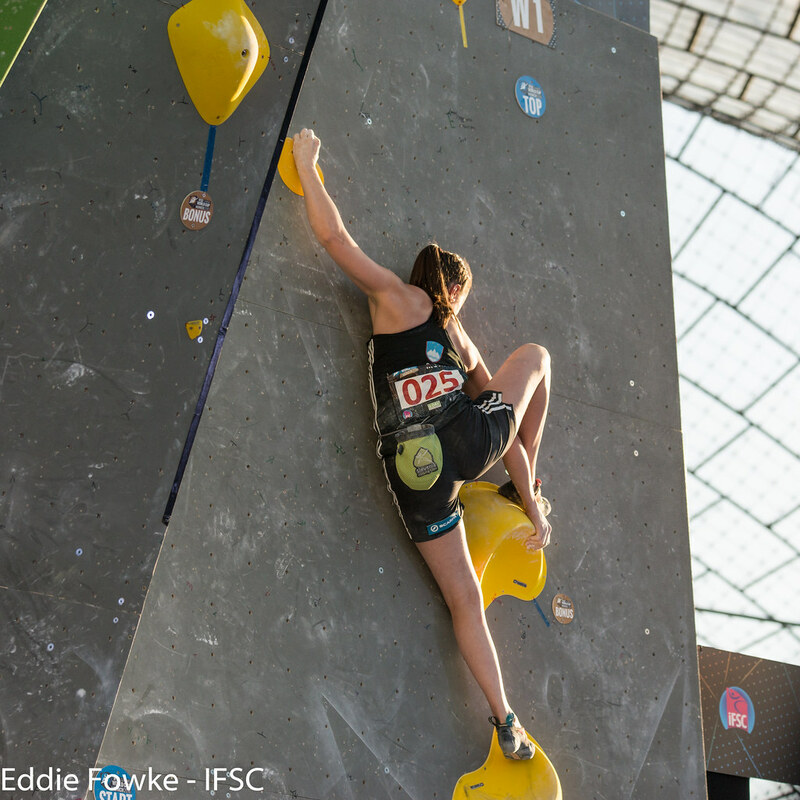 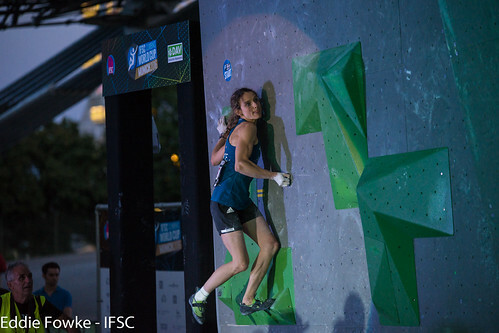 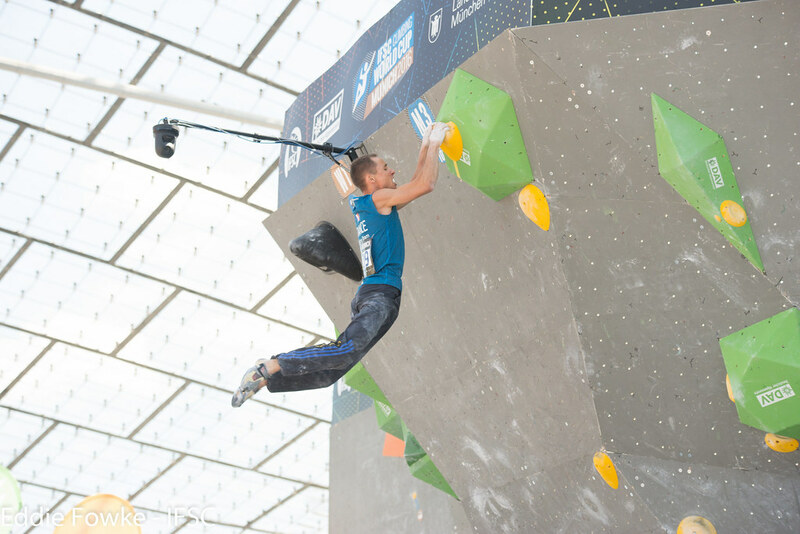 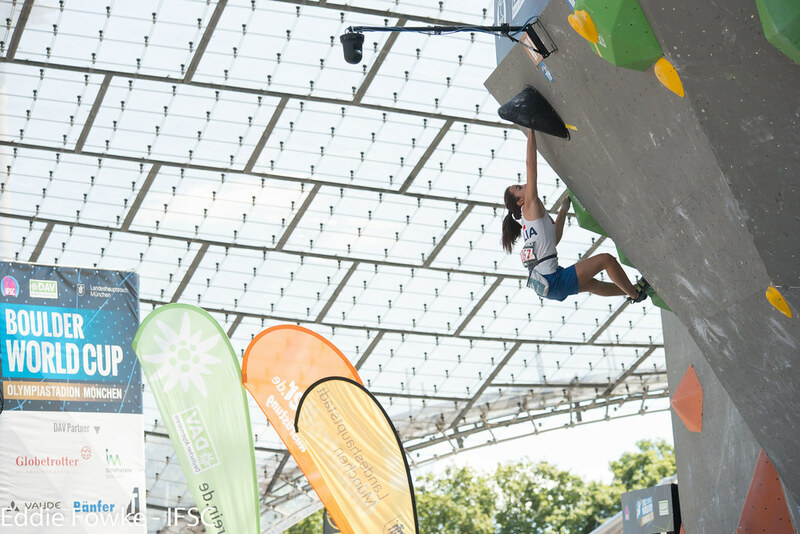 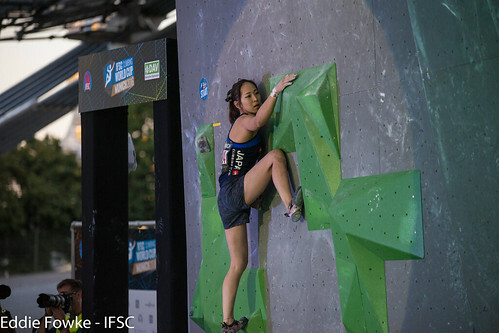 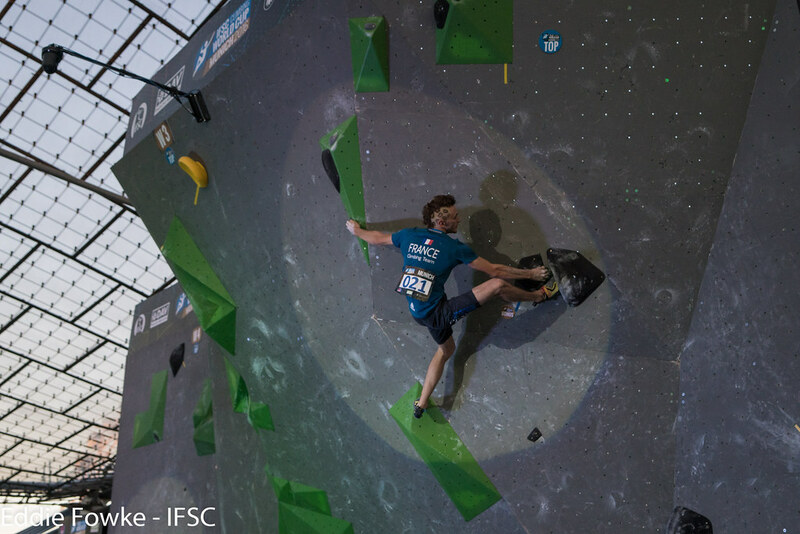 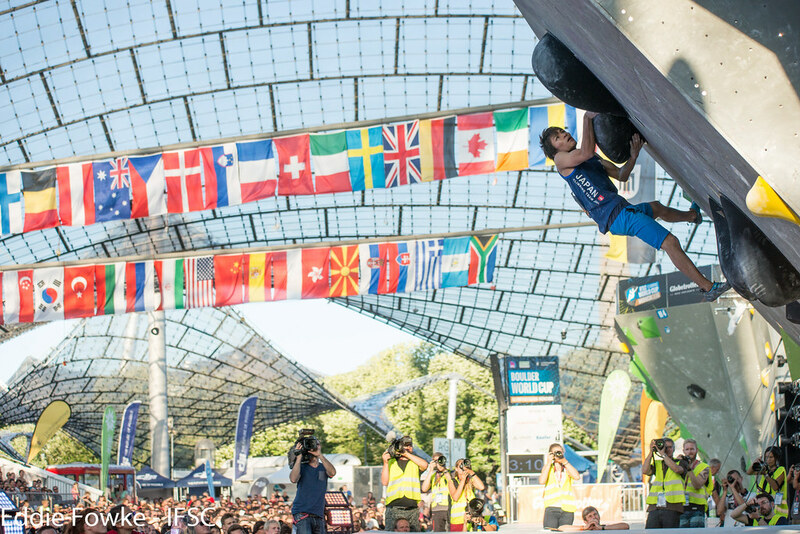 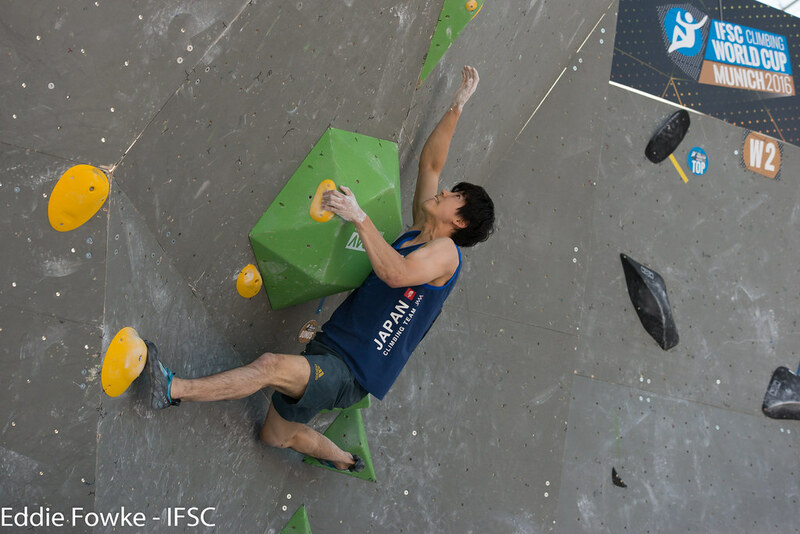 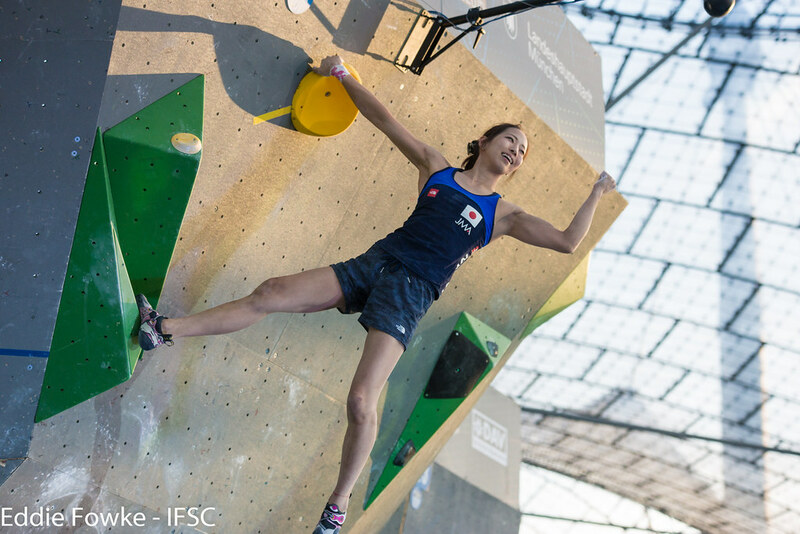 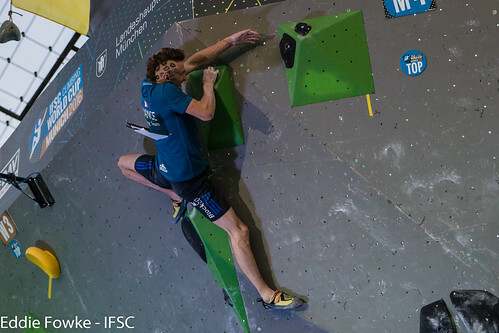 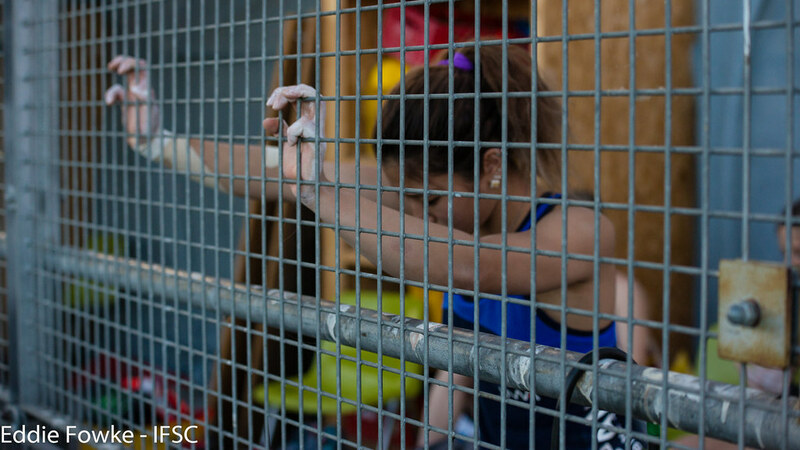 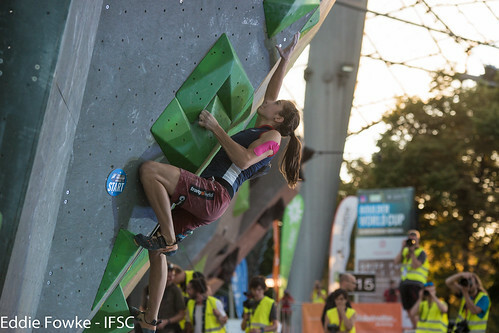 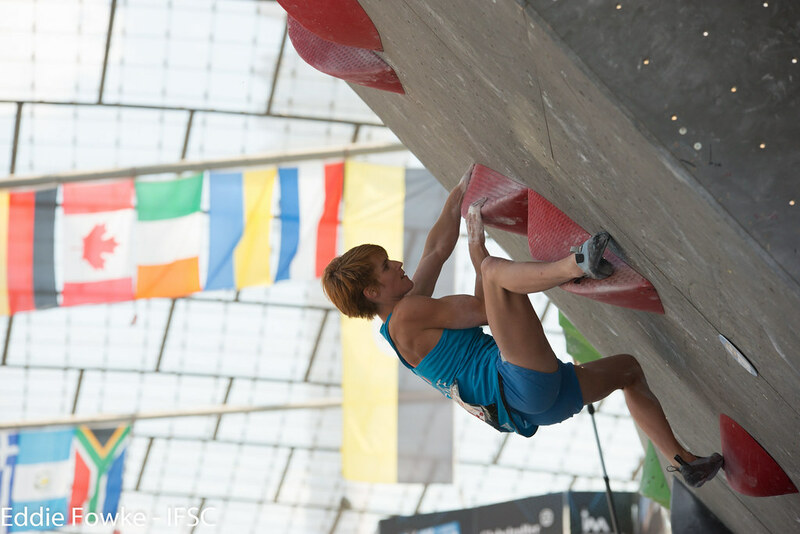 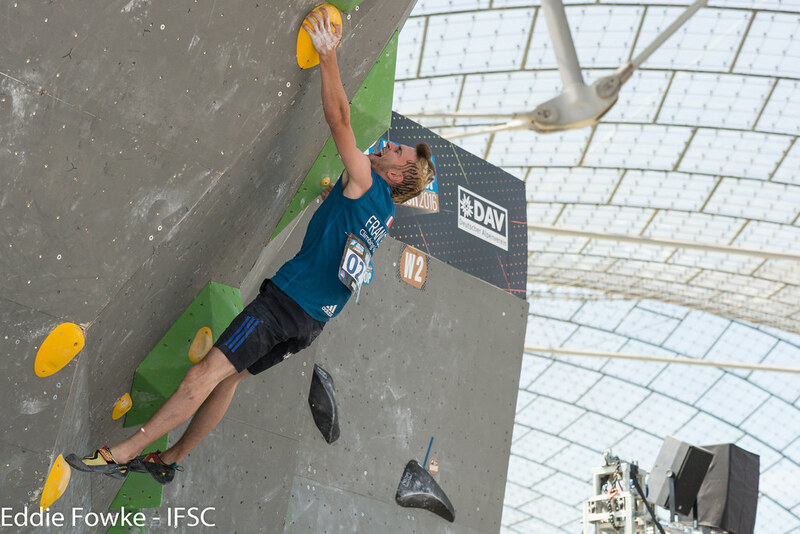 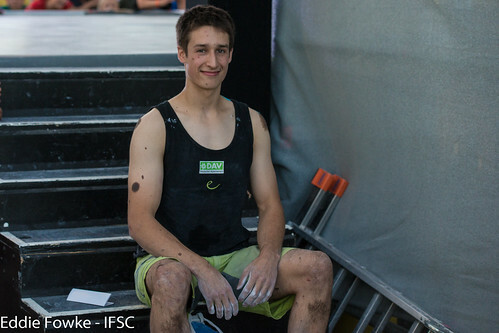 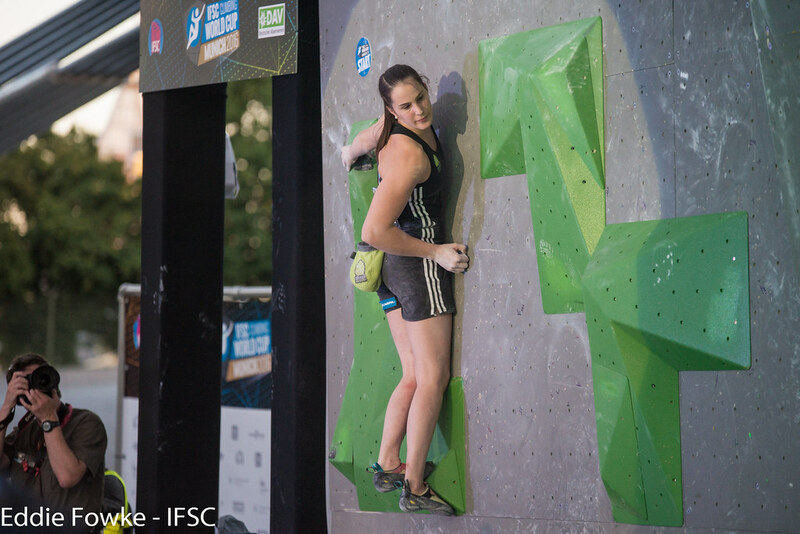 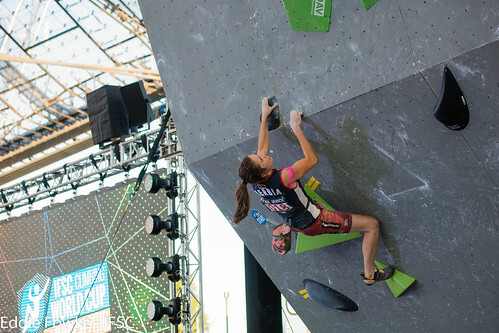 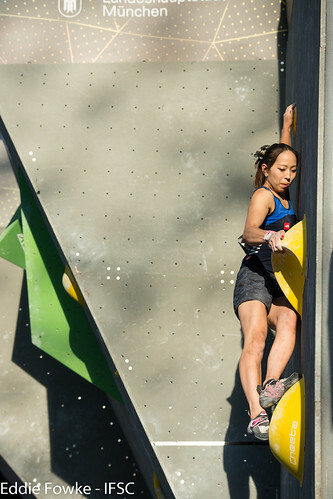 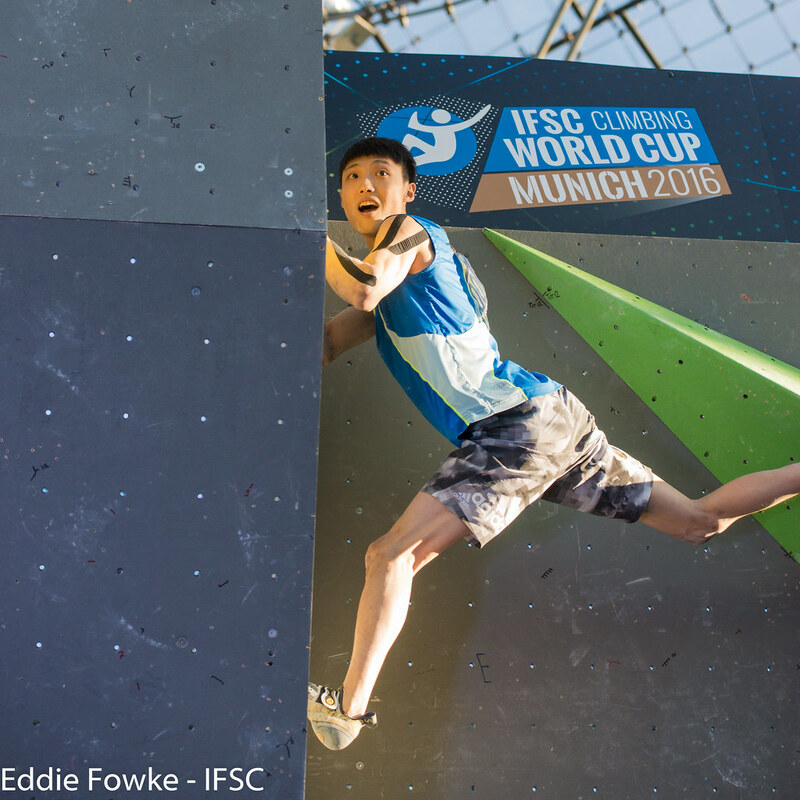 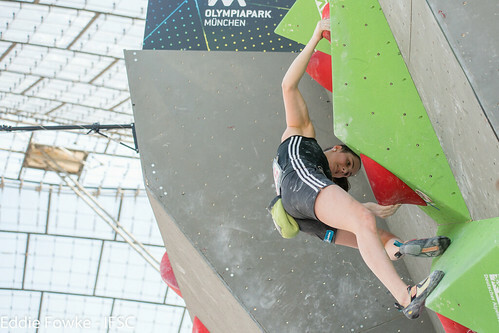 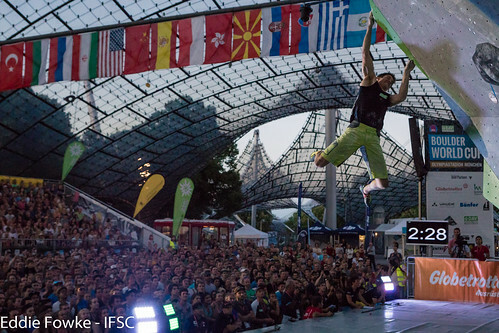 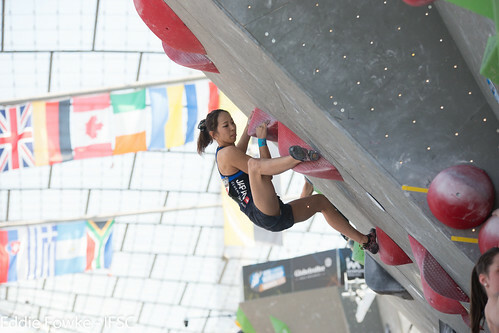 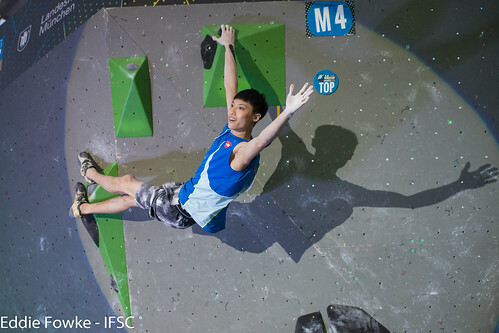 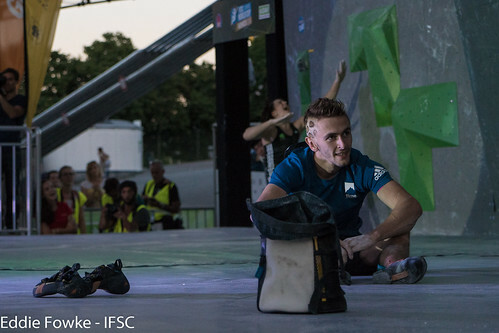 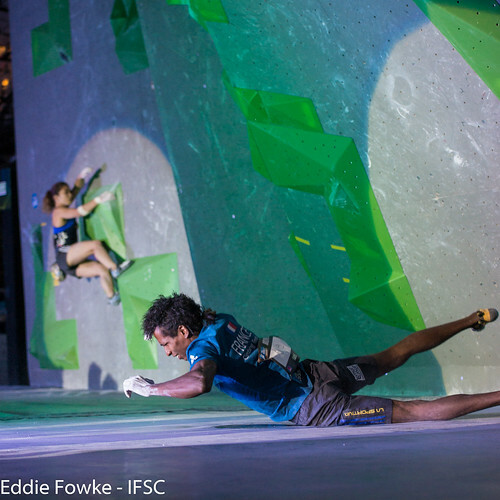 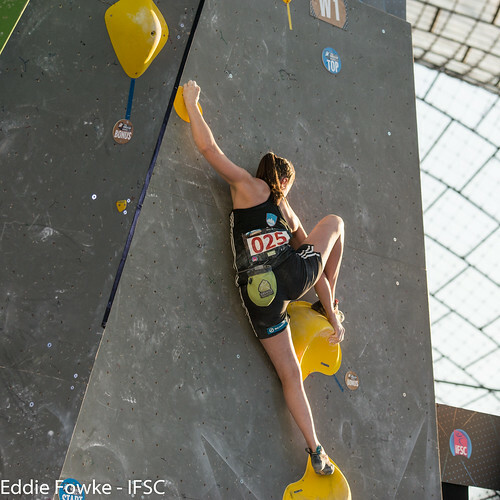 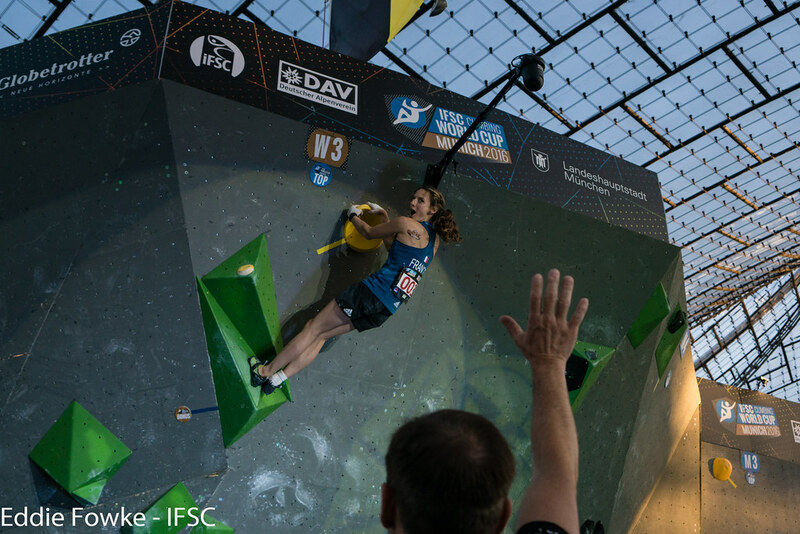 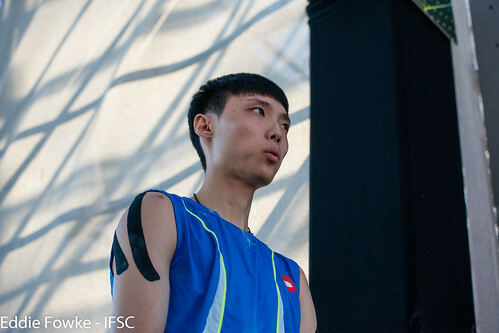 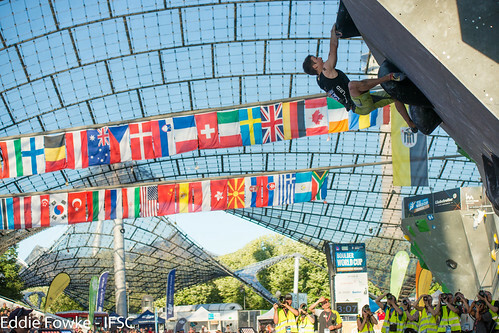 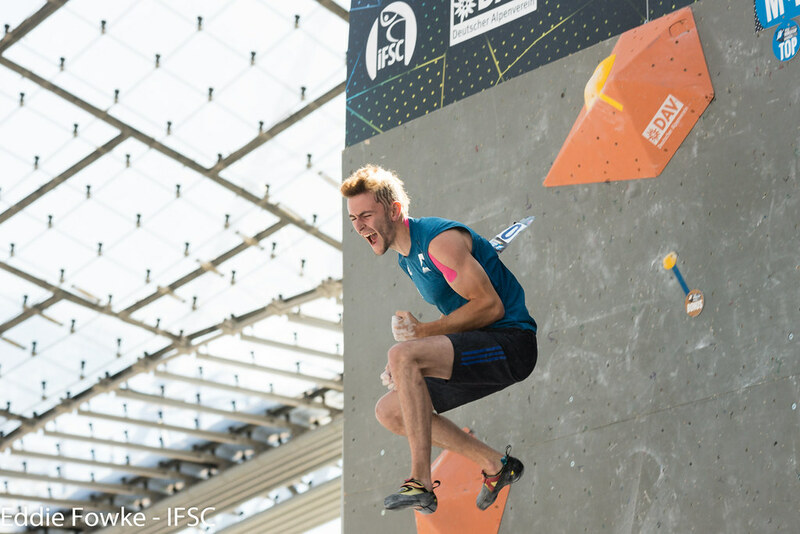 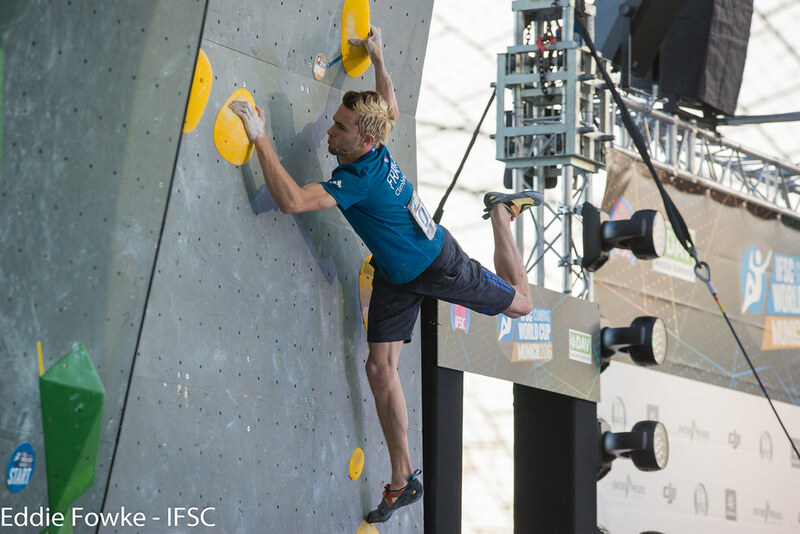 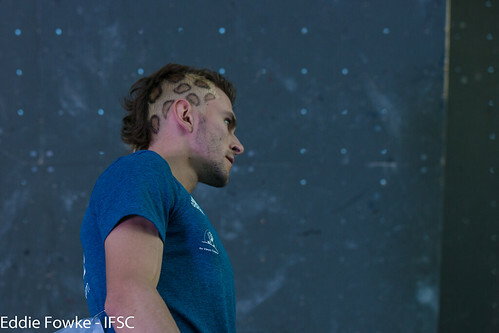 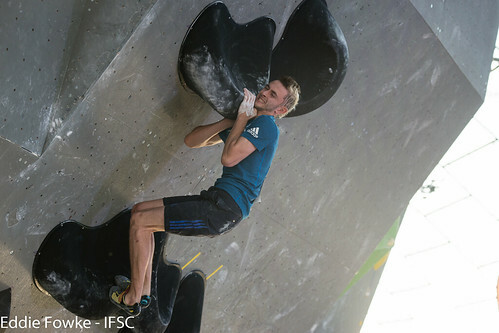 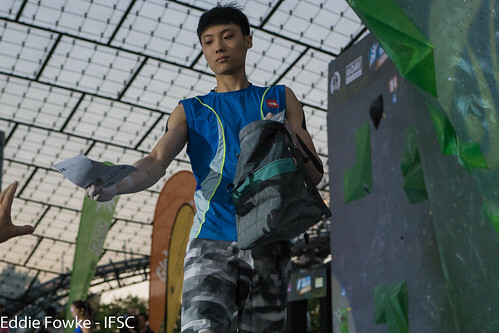 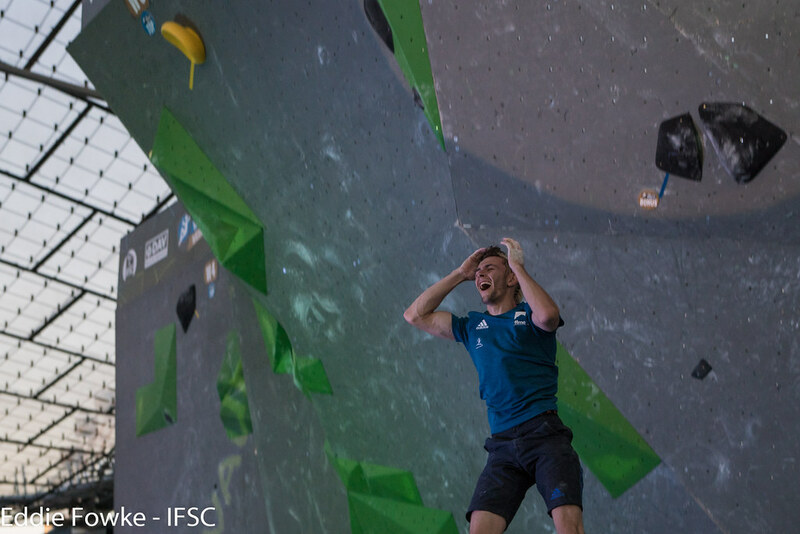 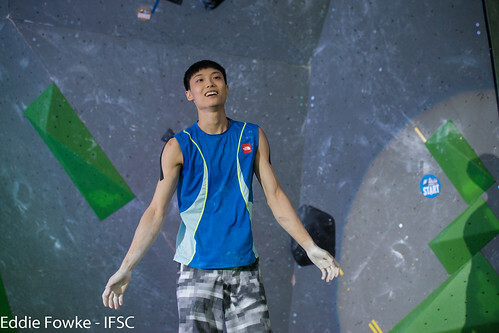 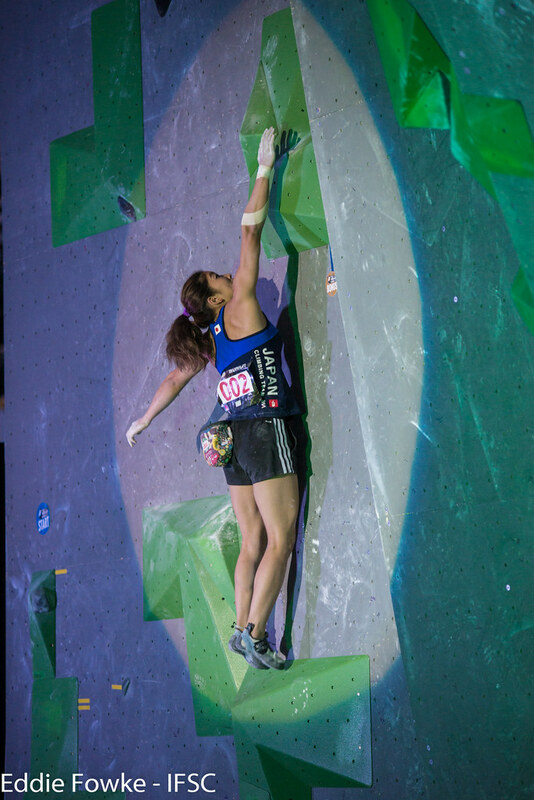 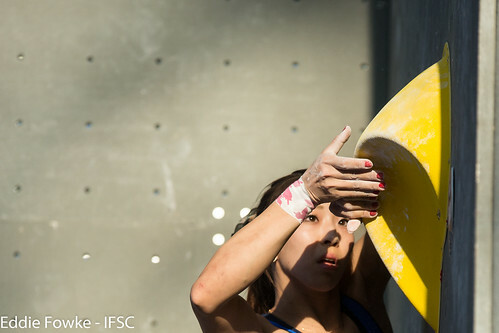 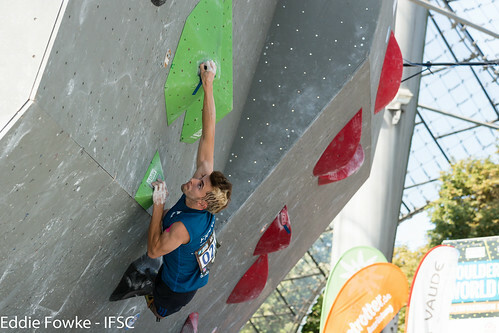 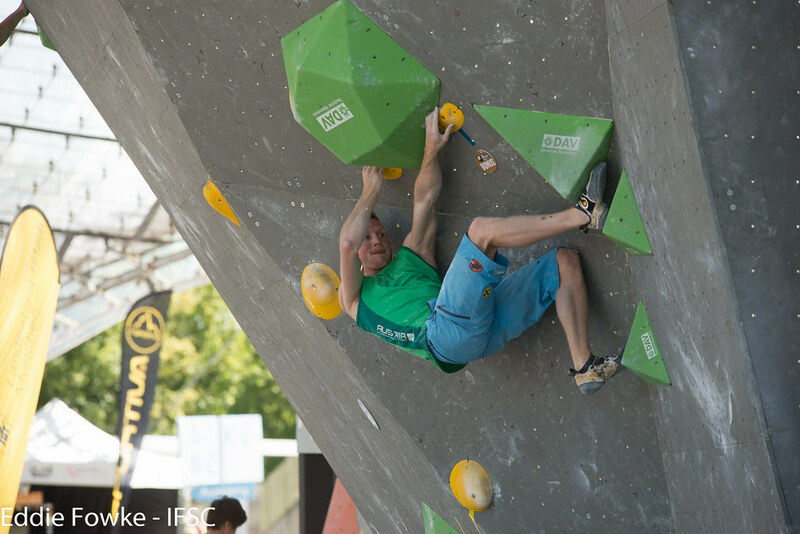 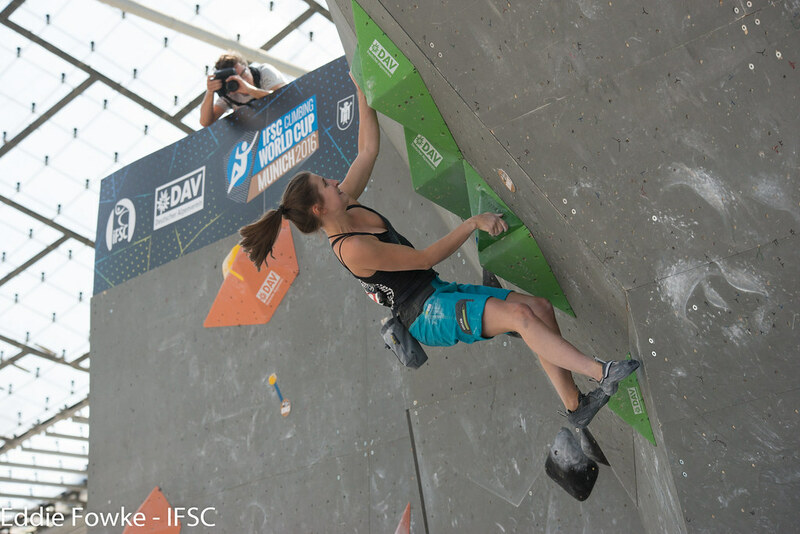 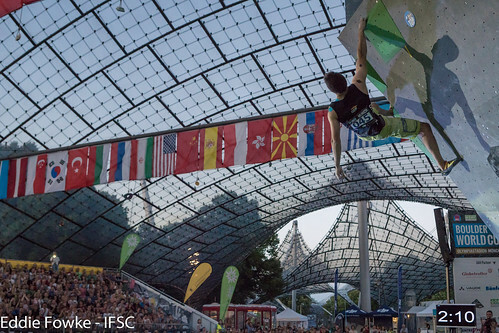 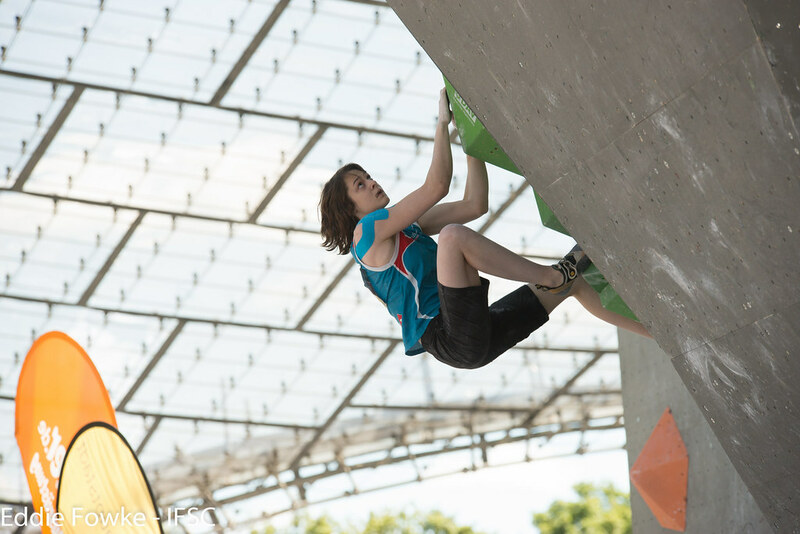 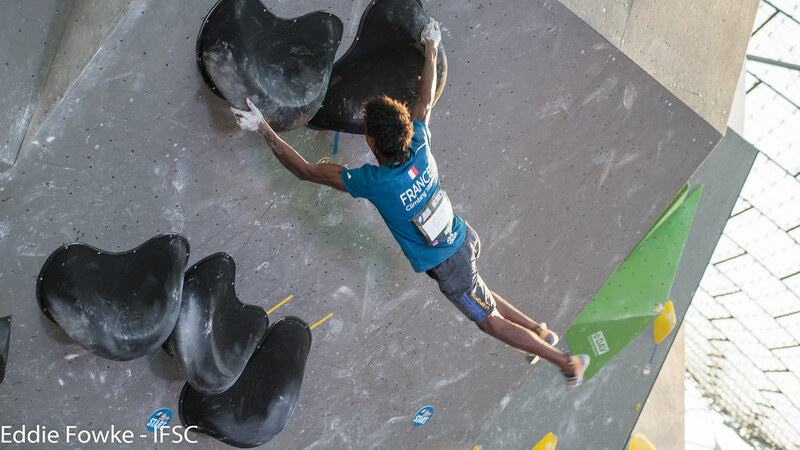 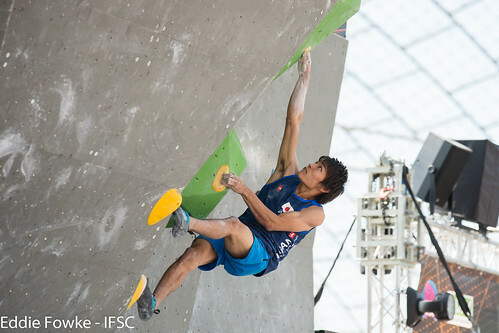 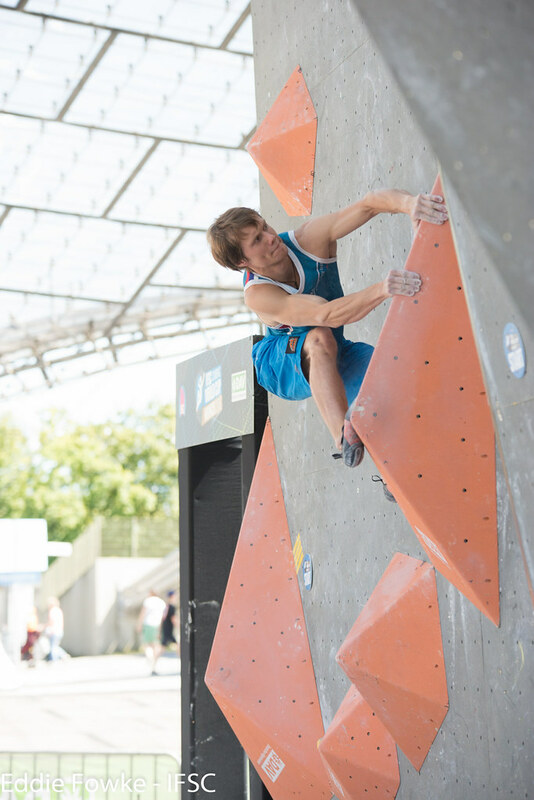 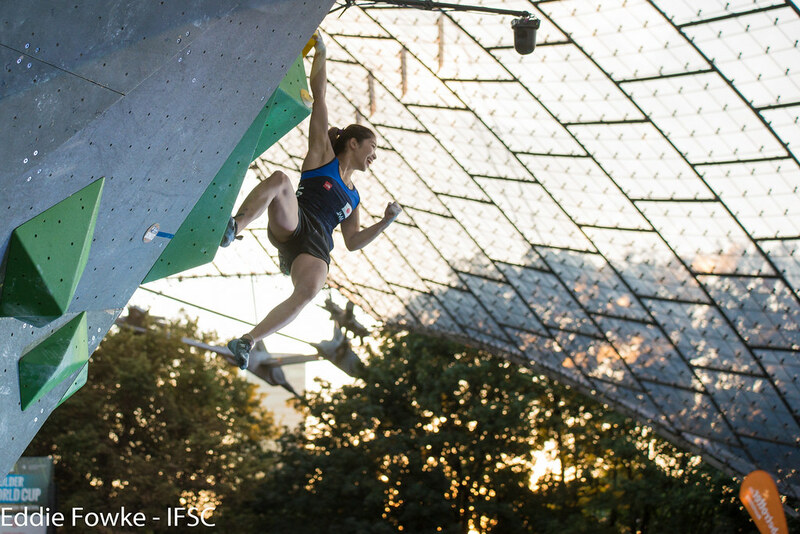 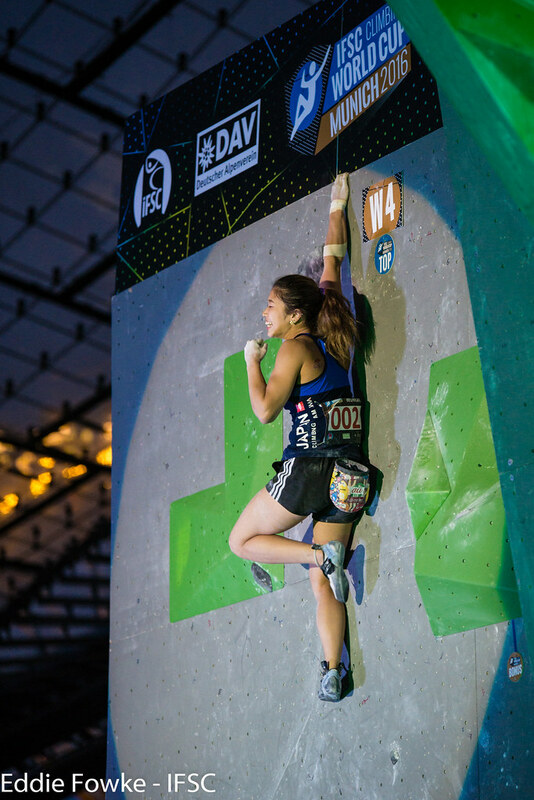 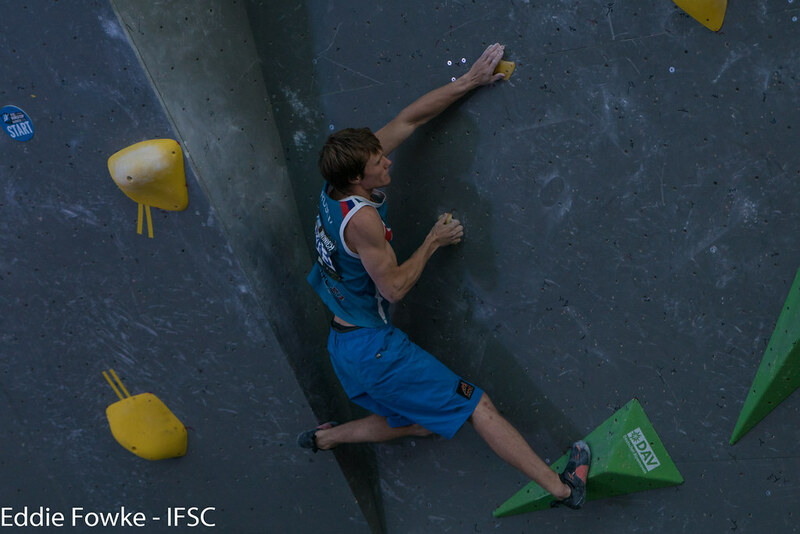 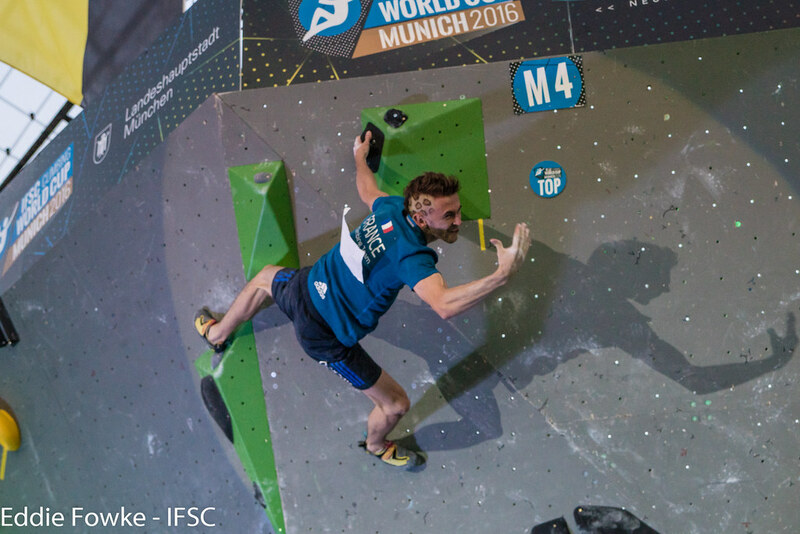 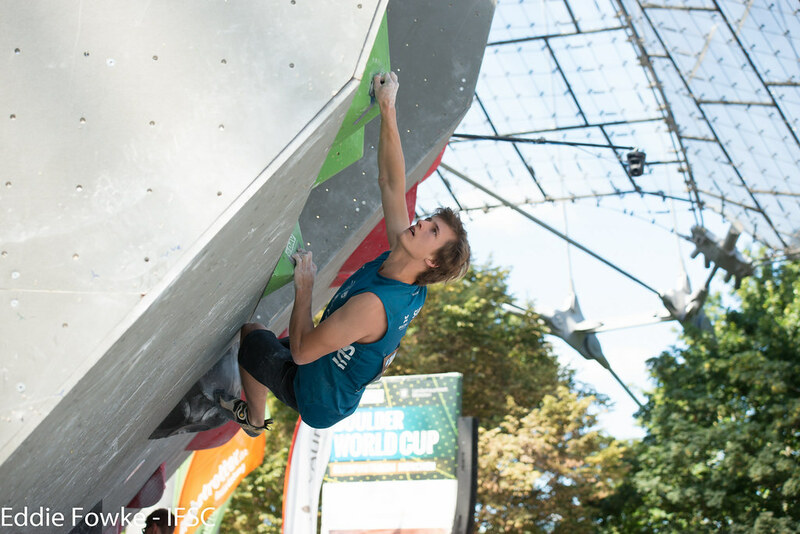 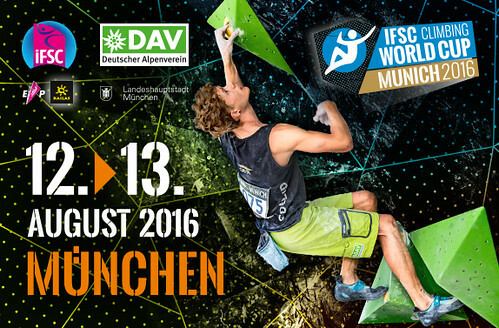 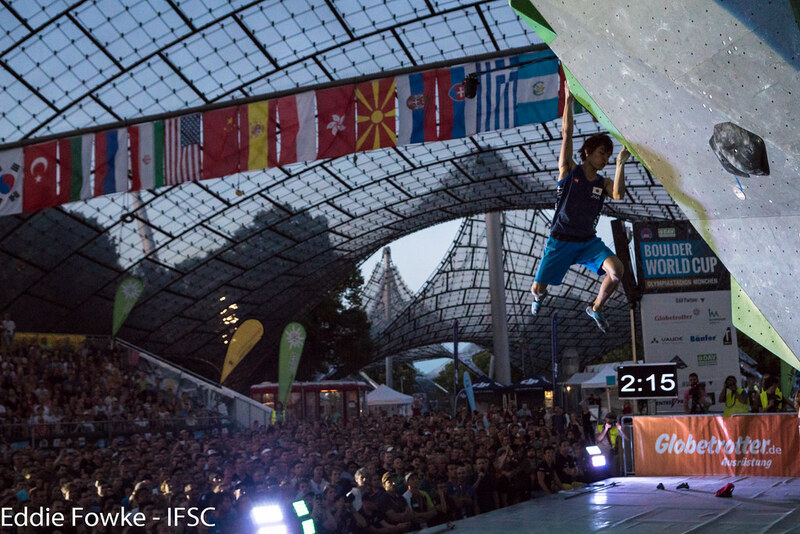 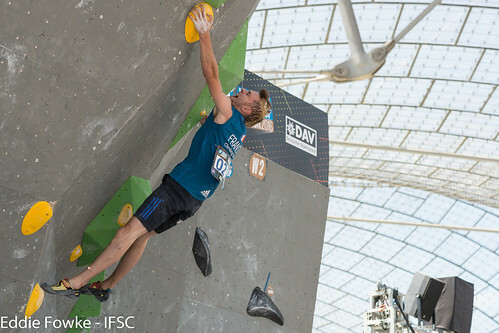 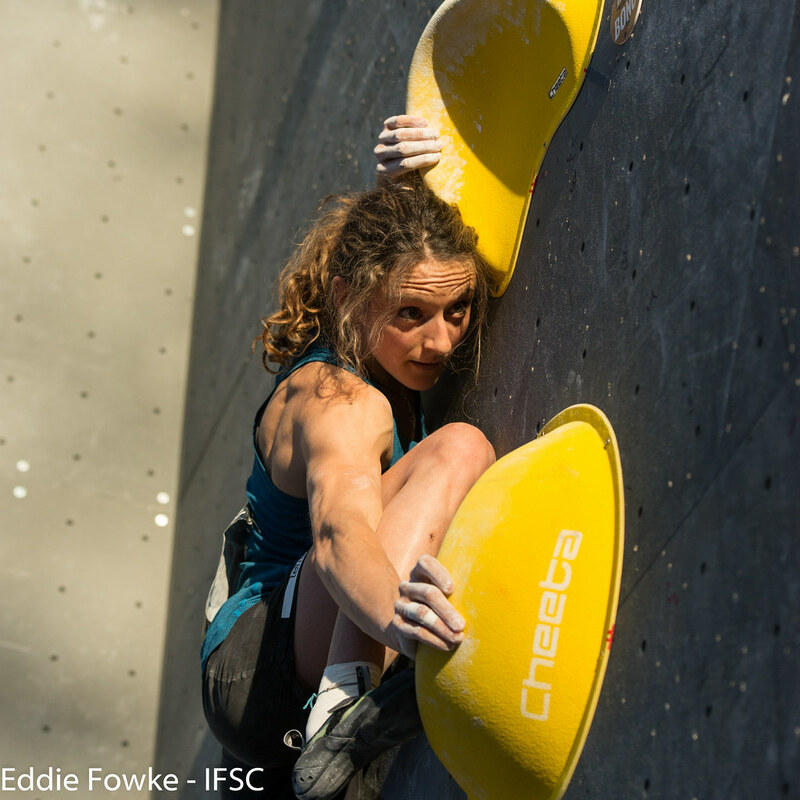 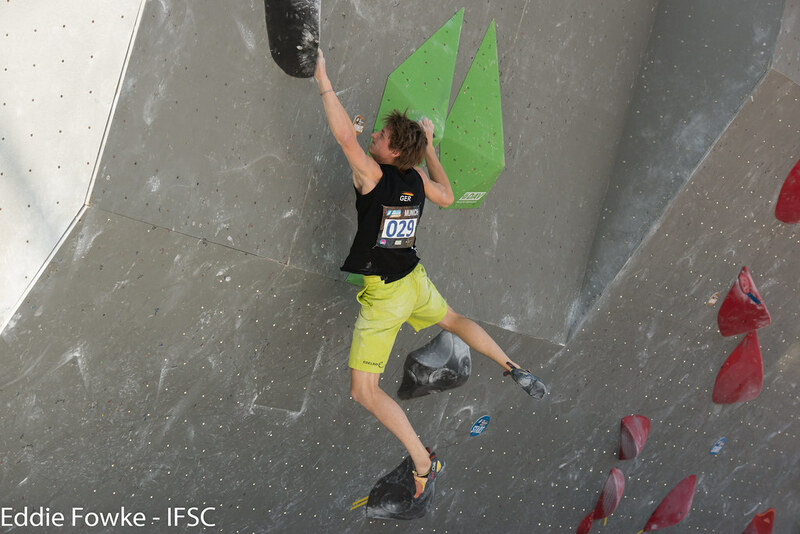 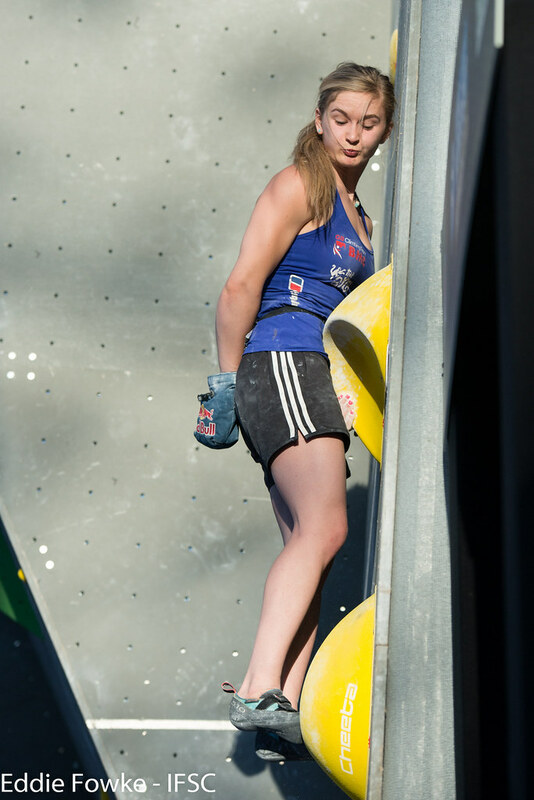 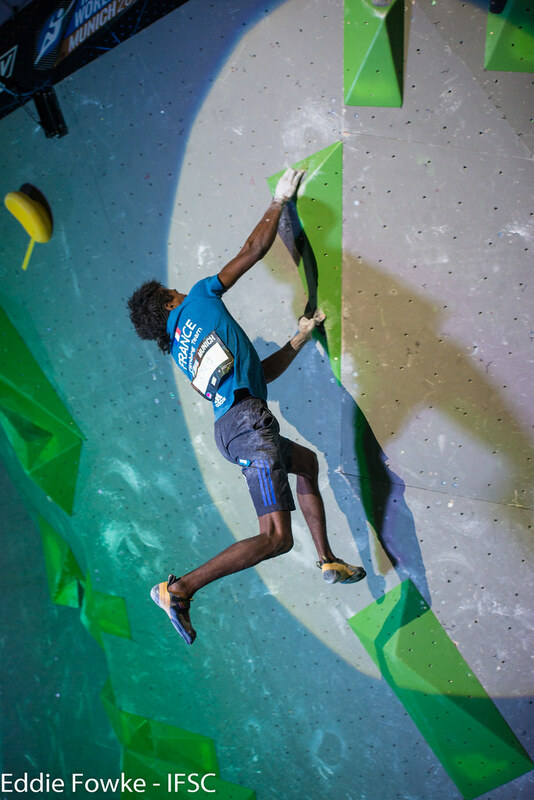 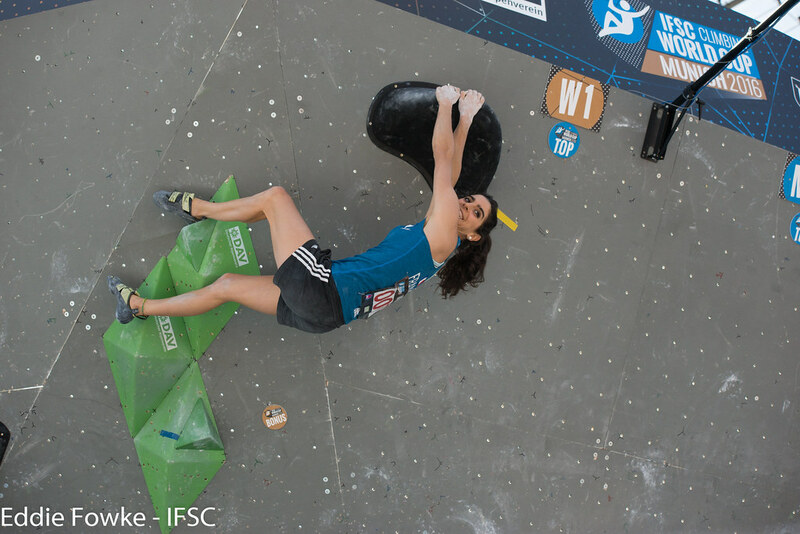 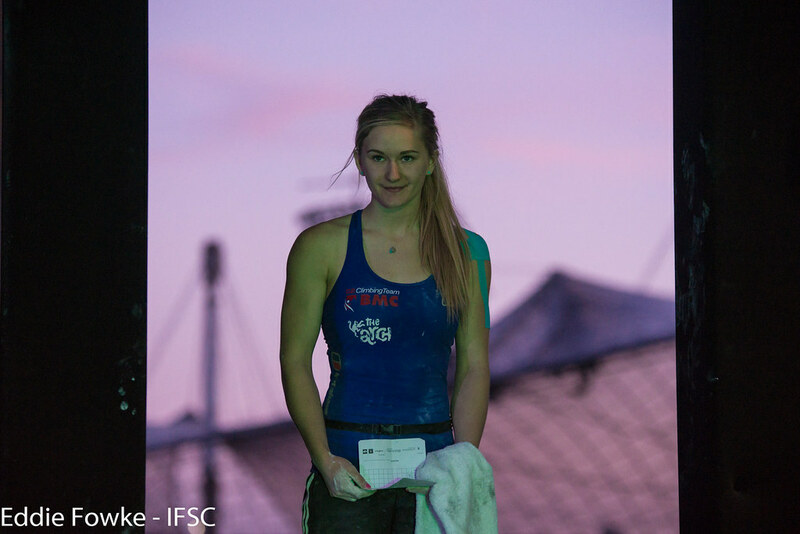 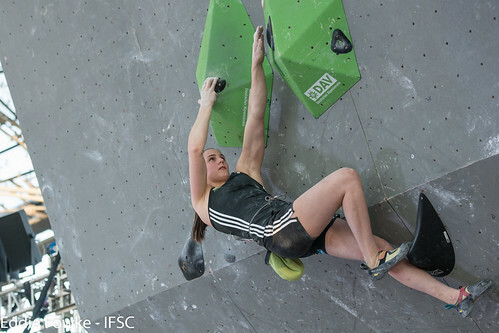 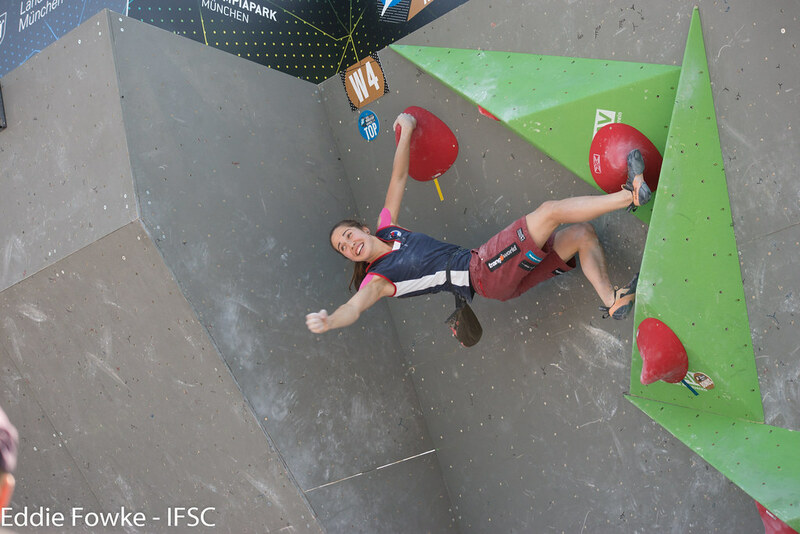 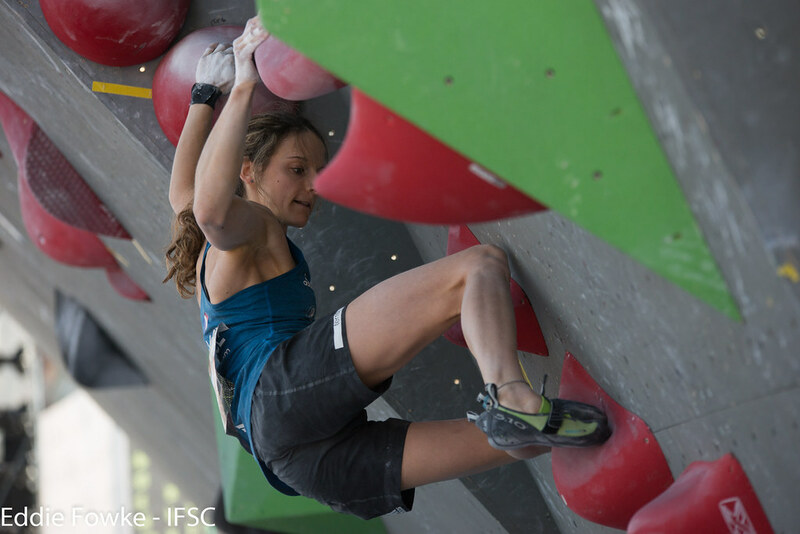 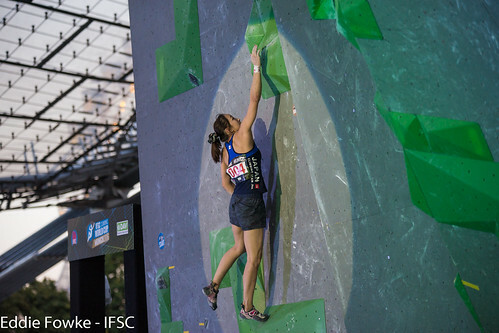 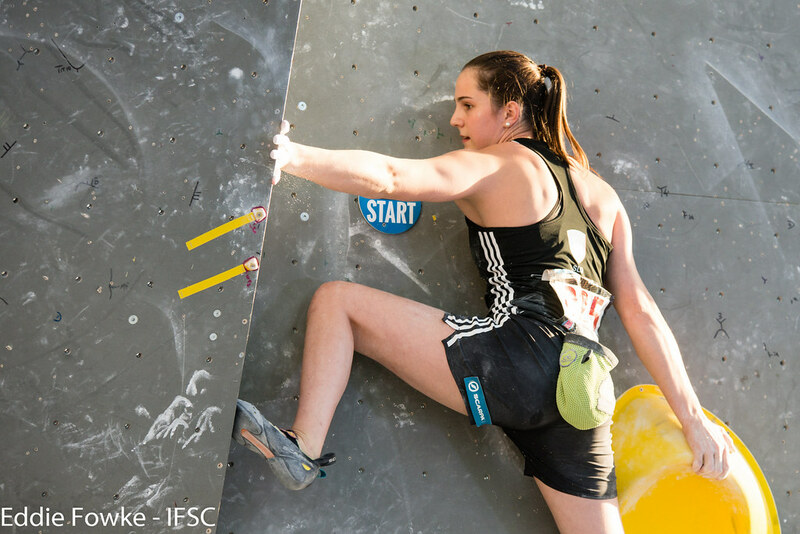 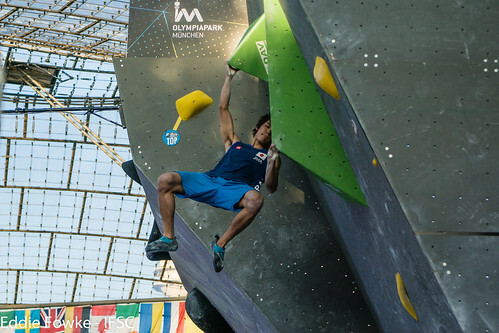 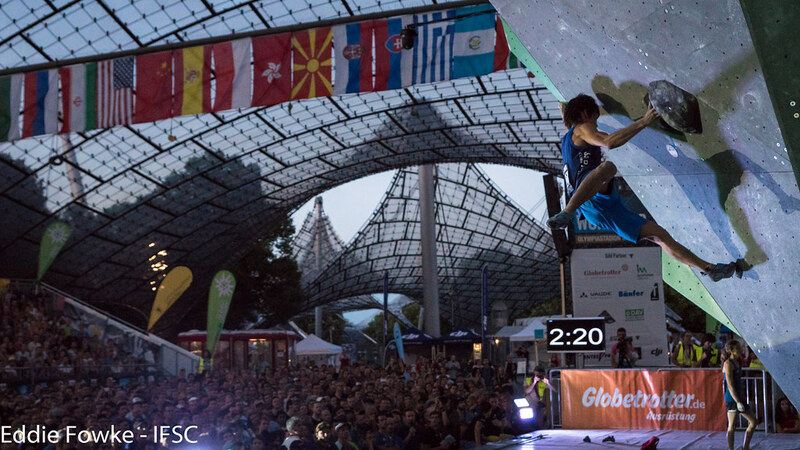 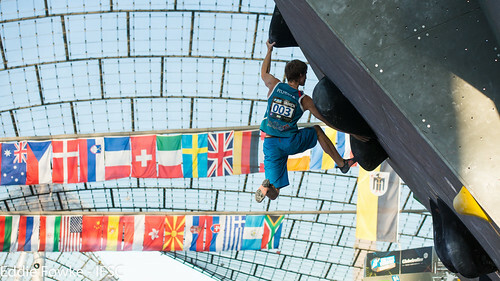 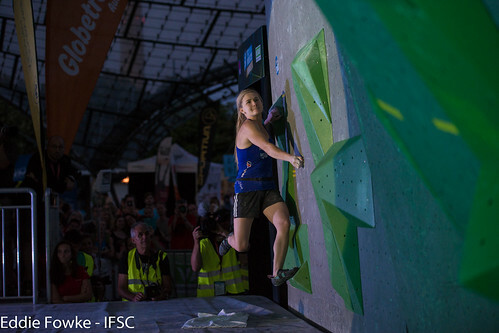 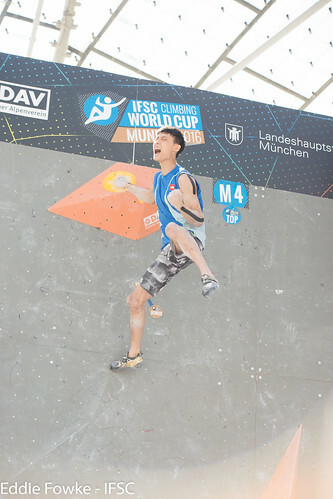 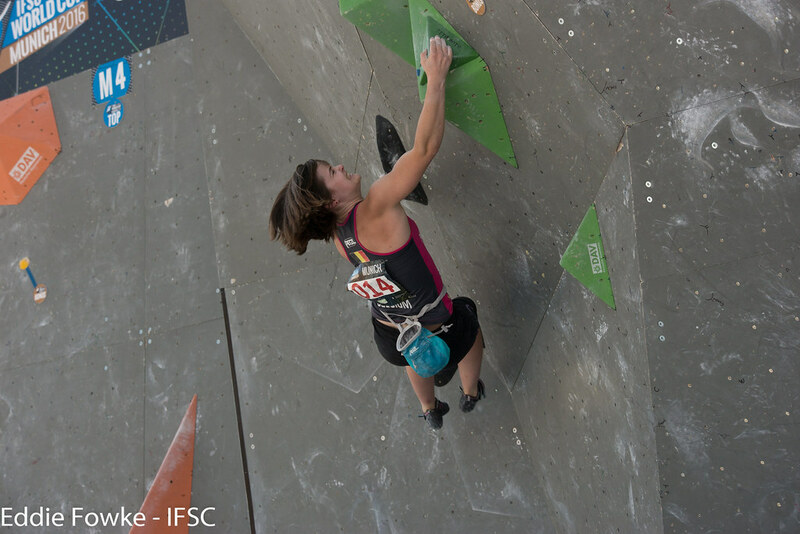 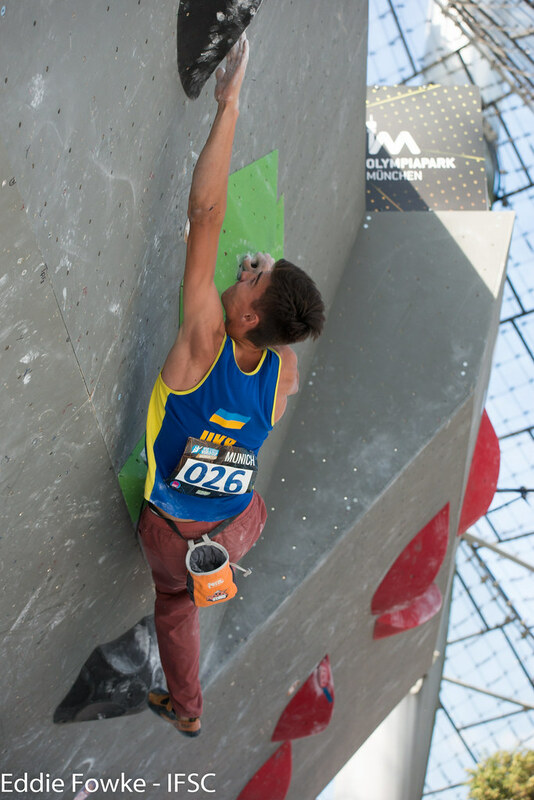 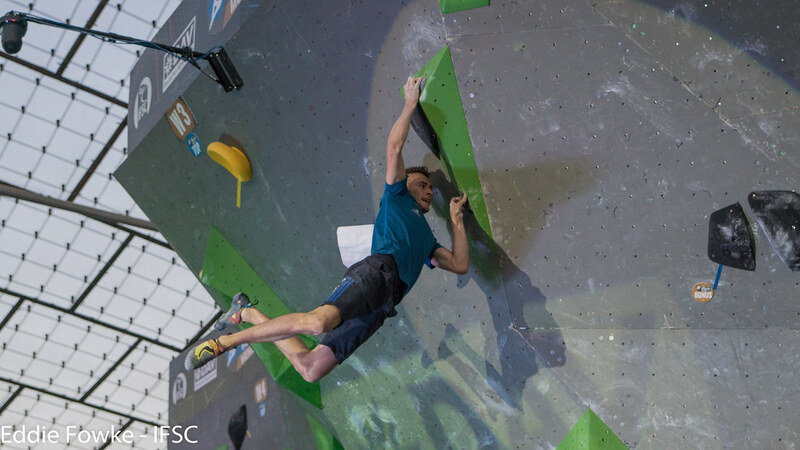 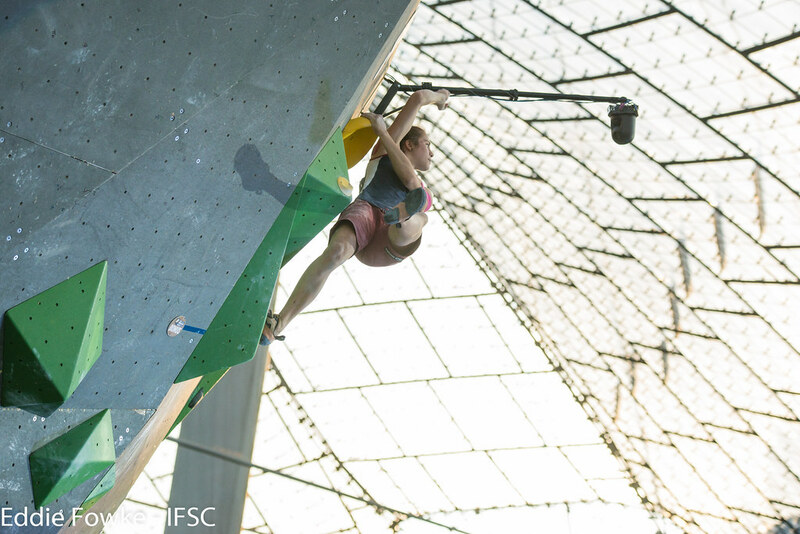 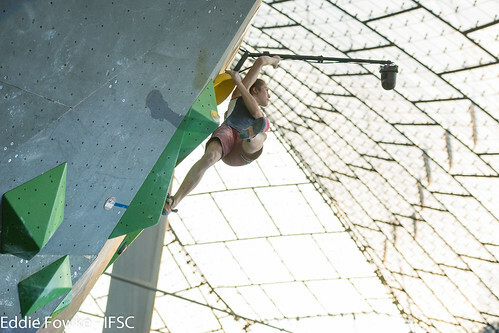 Tomoa Narasaki and Miho Nonaka of Japan finished on top in Munich at the seventh and final IFSC Bouldering World Cup of 2016. 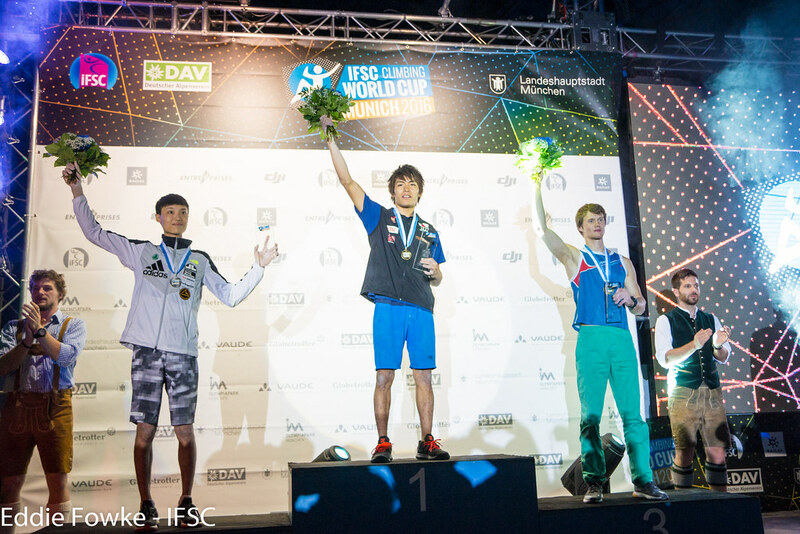 Narasaki's stellar performance was enough to defend his spot atop the Overall rankings, and Shauna Coxsey of Great Britain impressed with a Silver despite winning Gold in the Overall rankings at Vail. 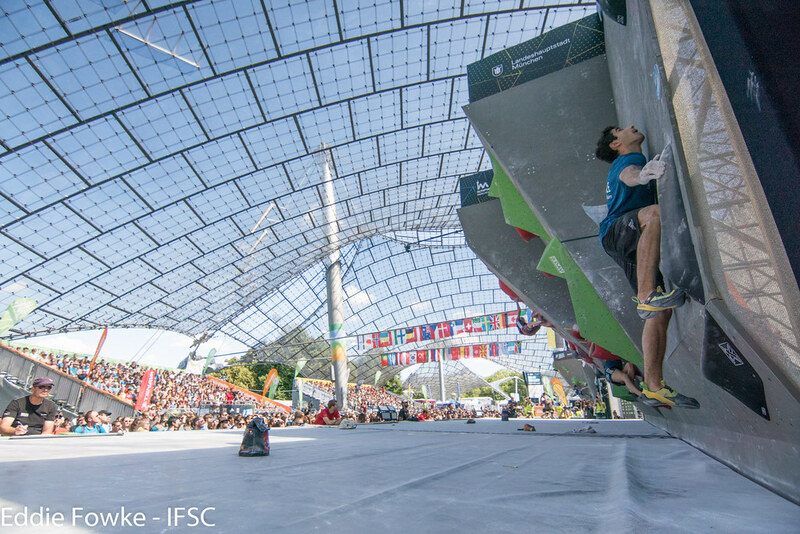 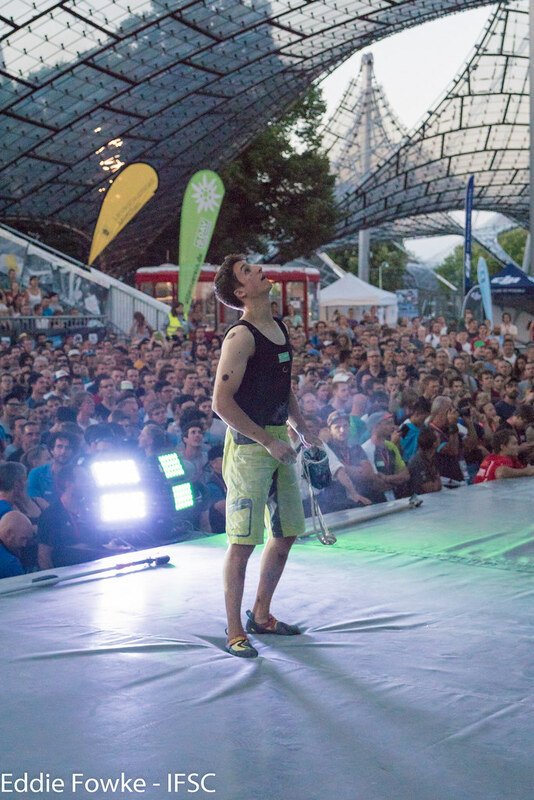 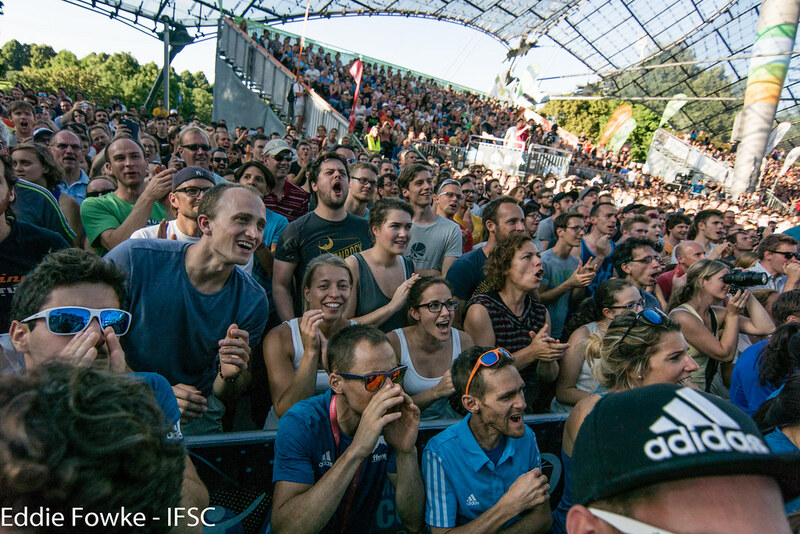 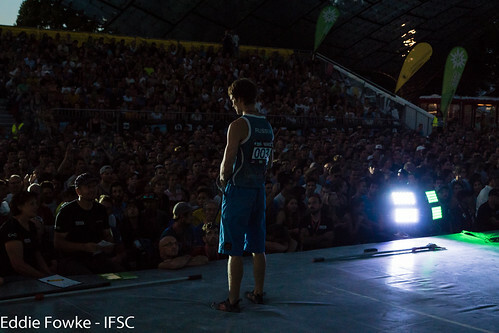 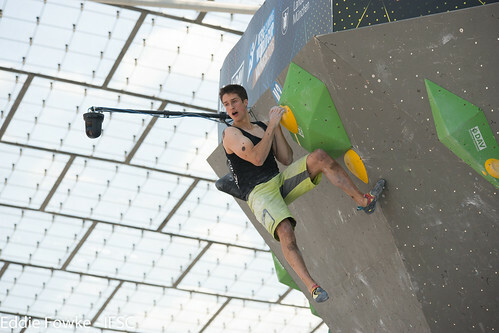 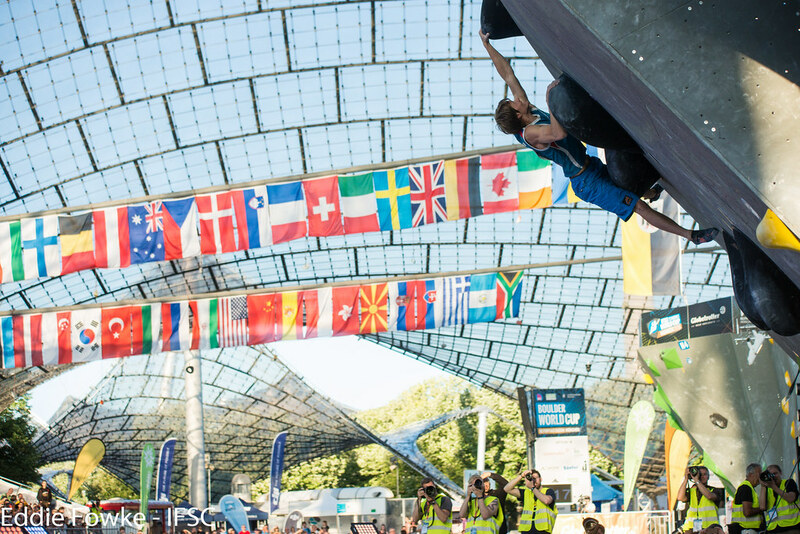 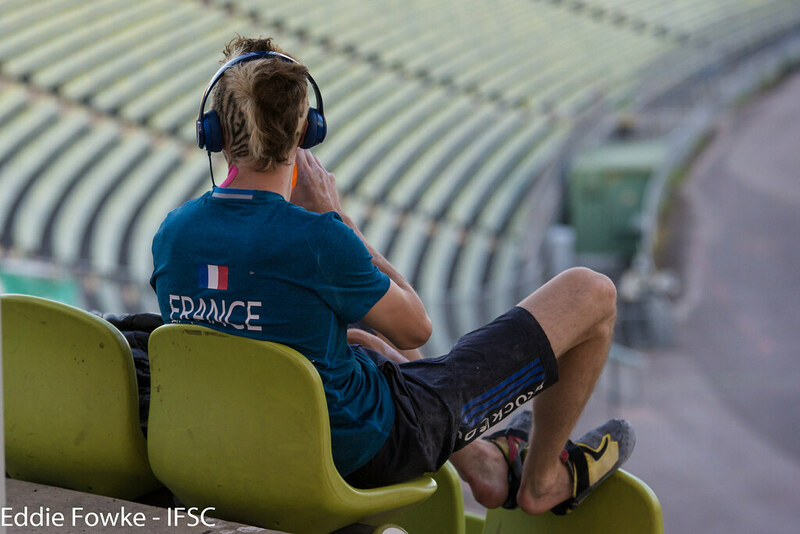 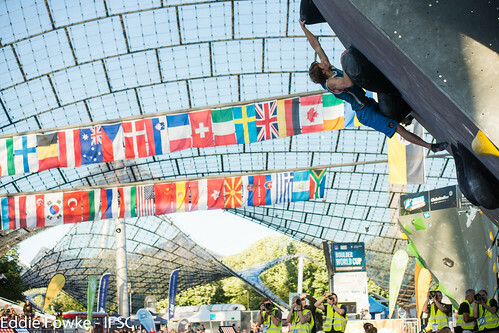 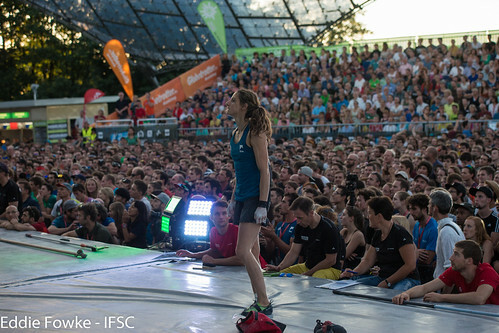 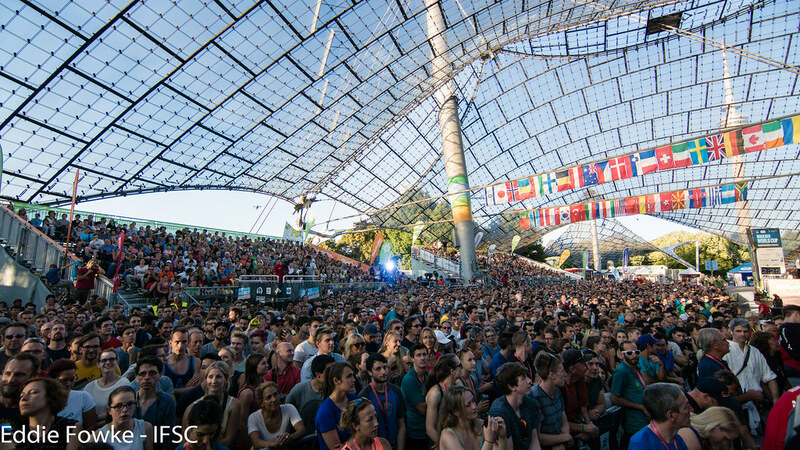 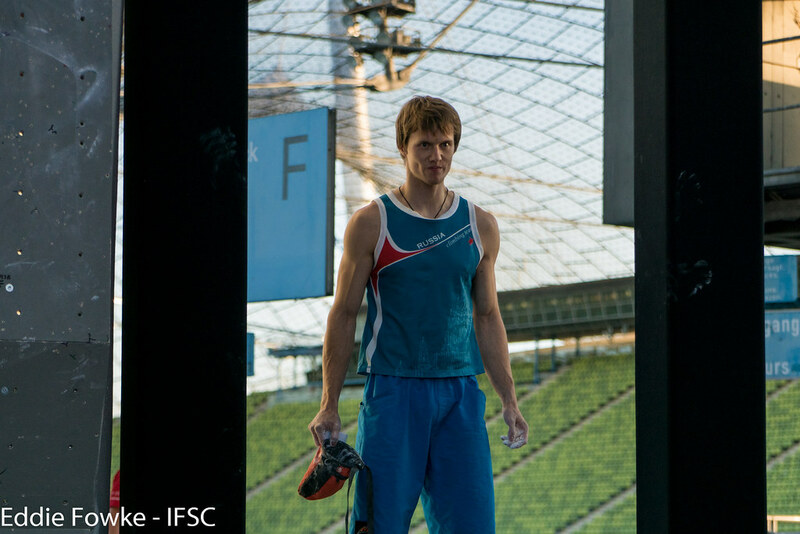 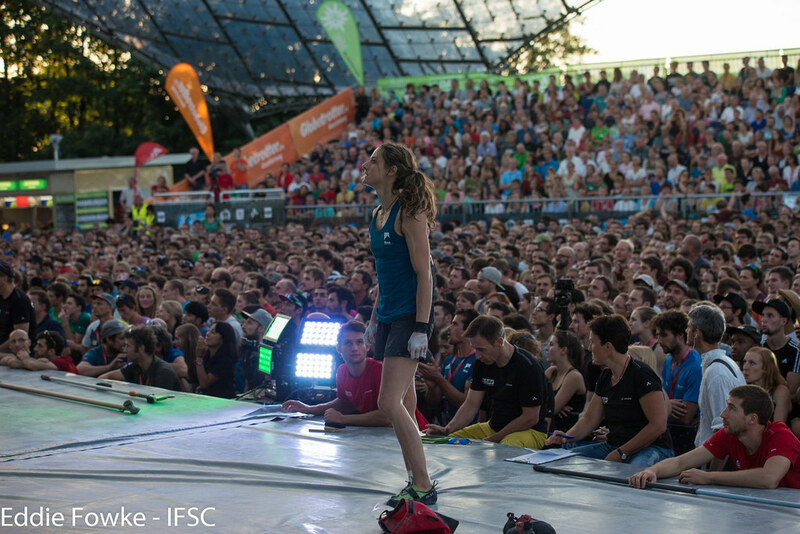 Once again, the Olympic Stadium in Munich was packed for the final IFSC Bouldering World Cup of 2016. 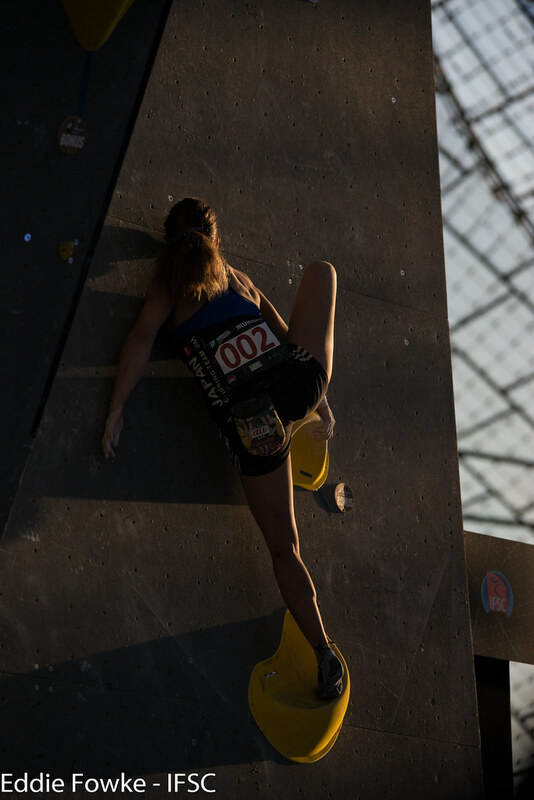 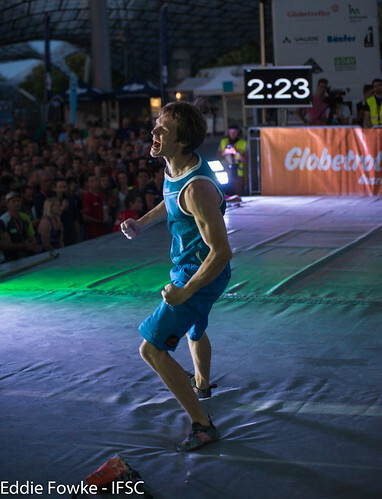 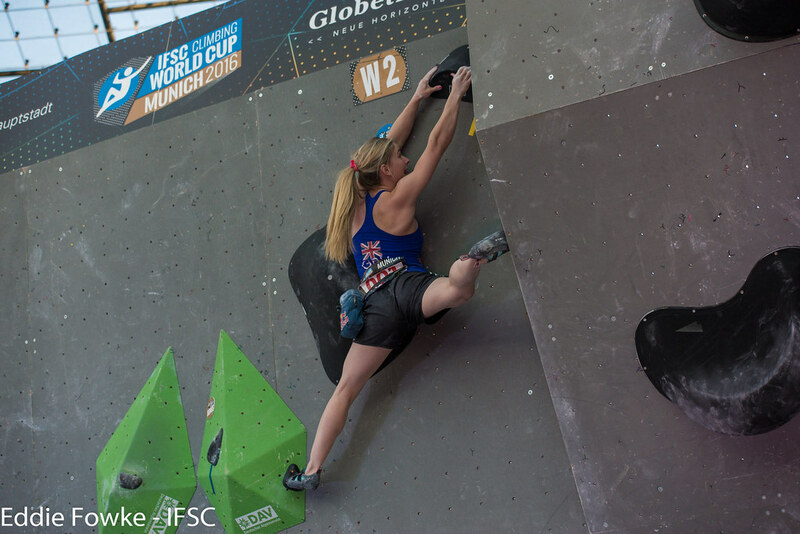 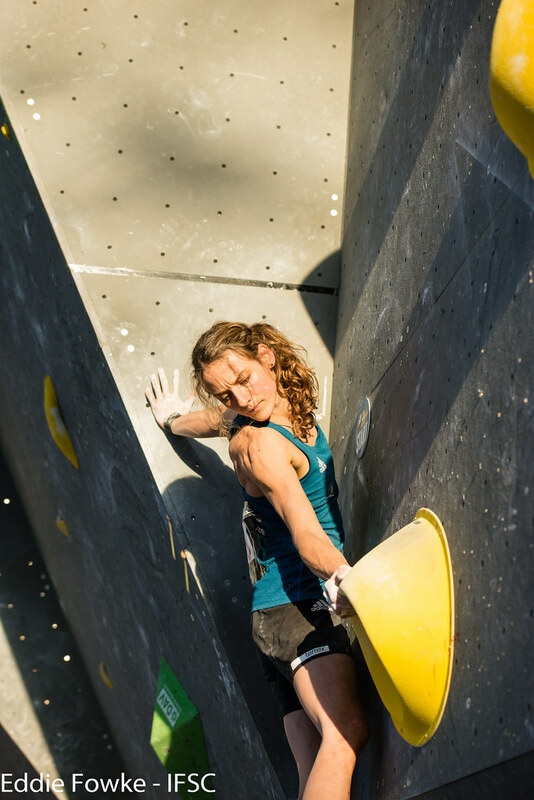 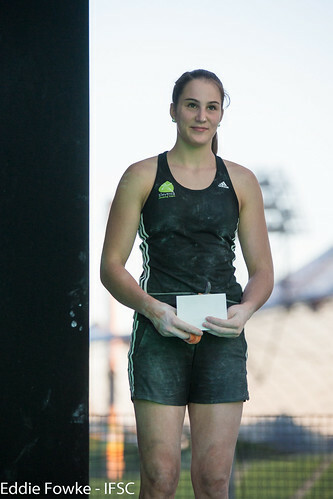 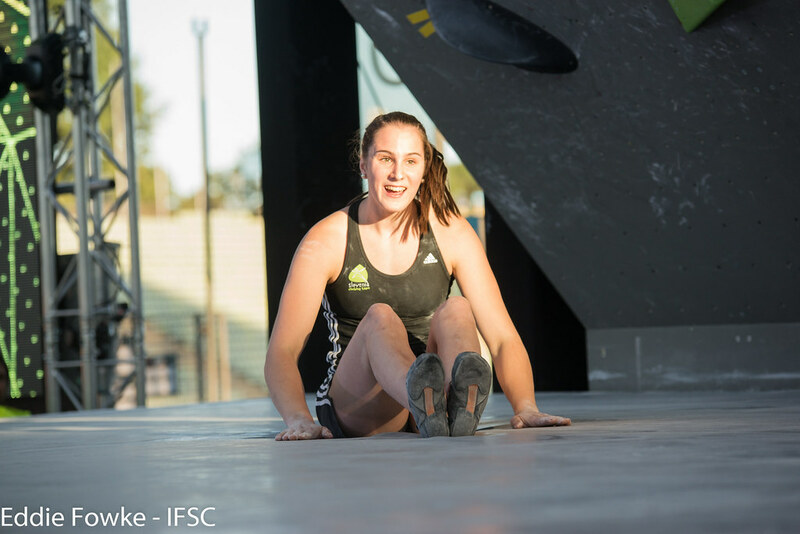 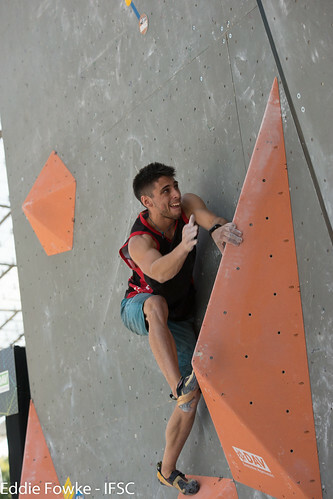 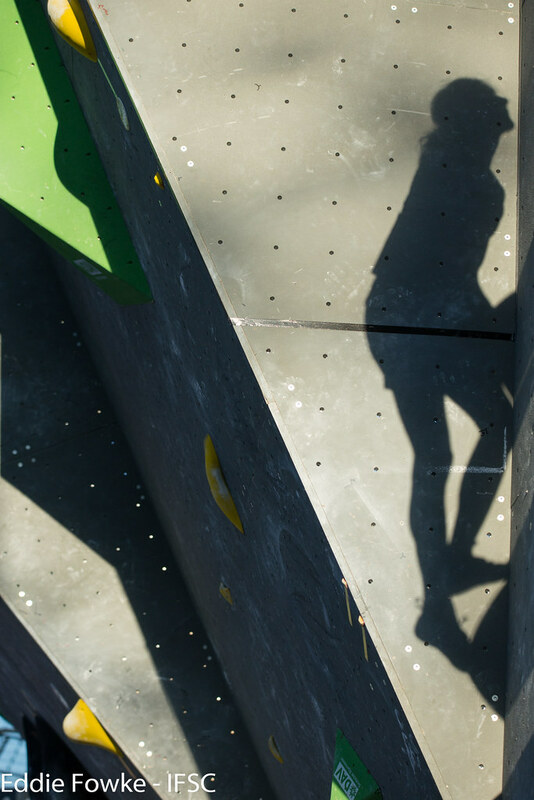 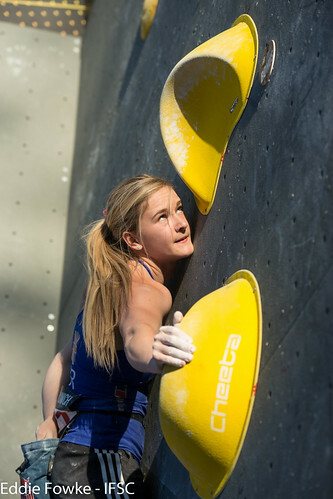 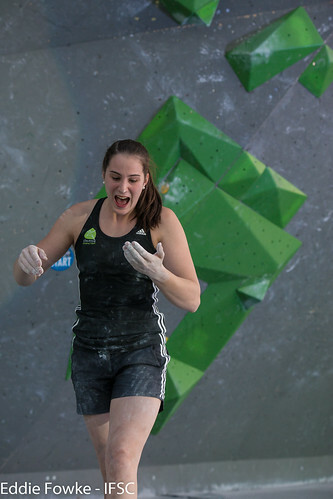 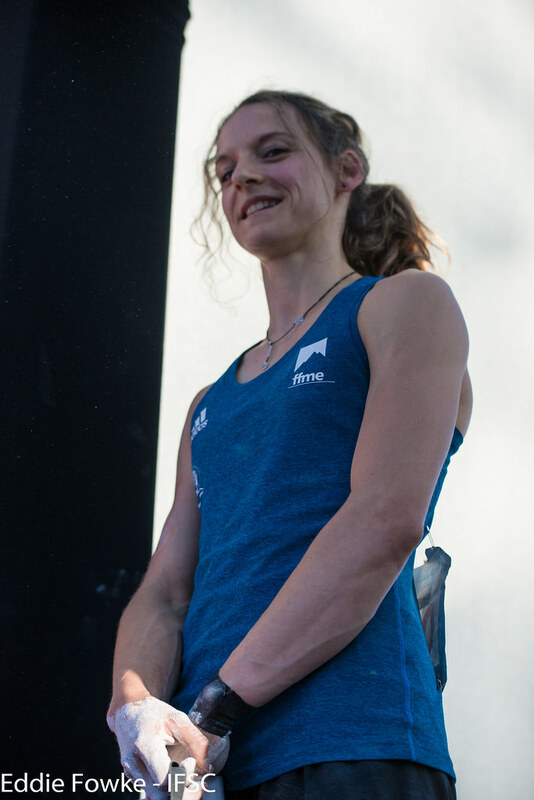 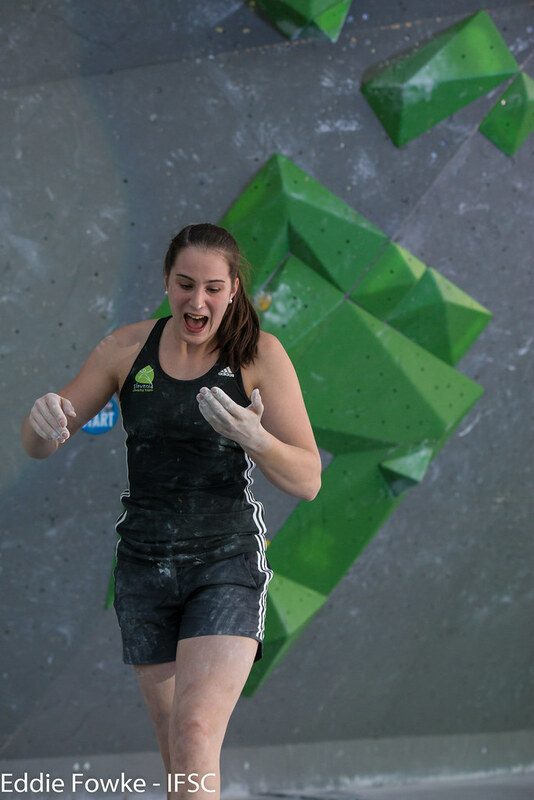 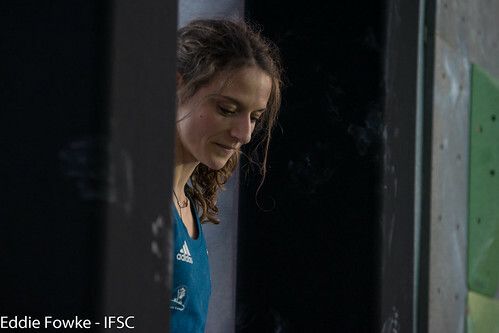 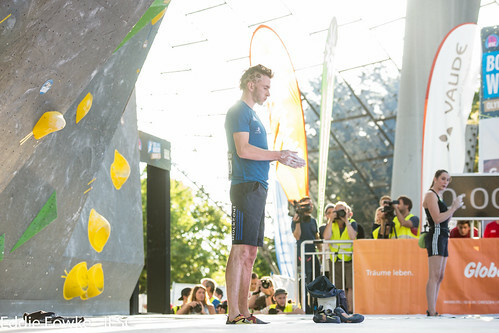 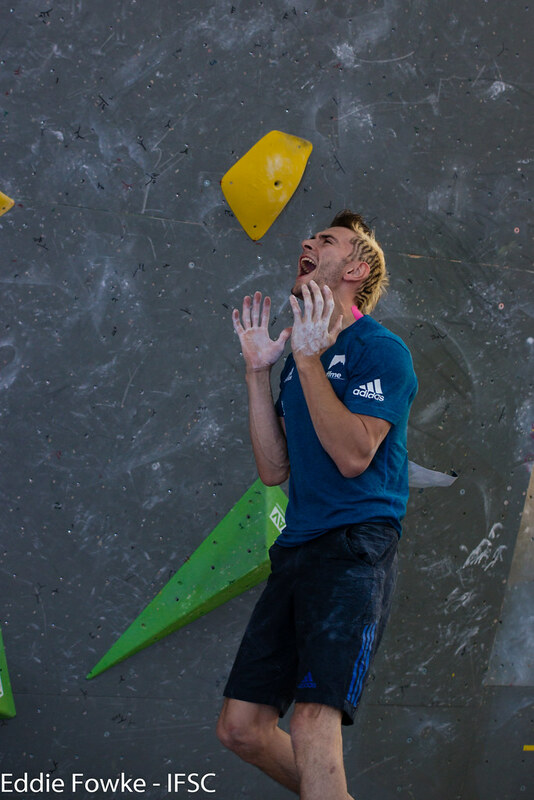 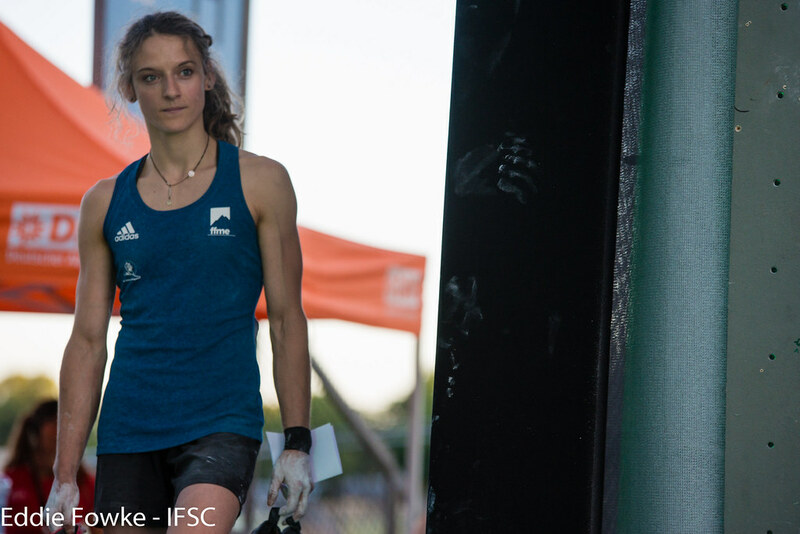 After a cold and drizzly Qualifications, the best Bouldering athletes in the world chalked up in sunshine on Saturday to make their final bid for a medal. 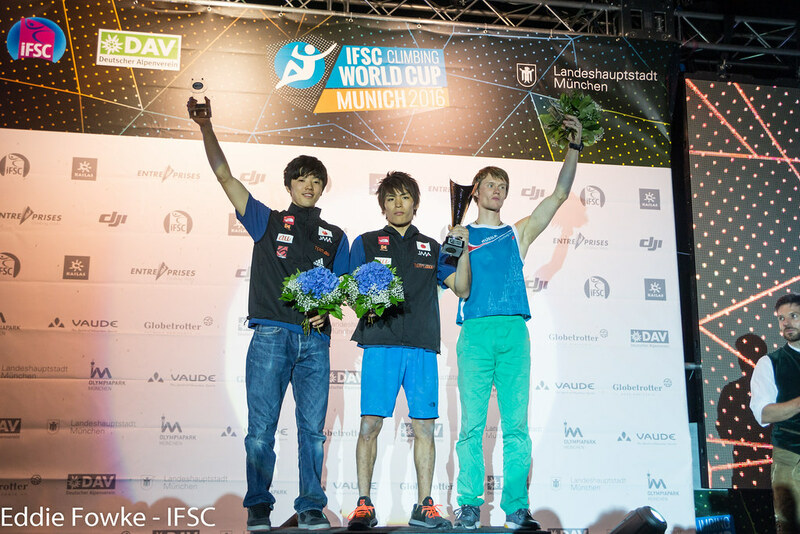 Here's how the hardware was distributed, both for Munich and the Overall rankings. 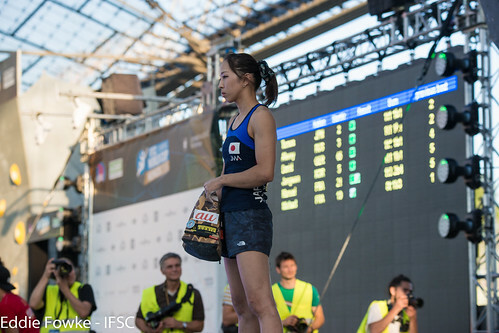 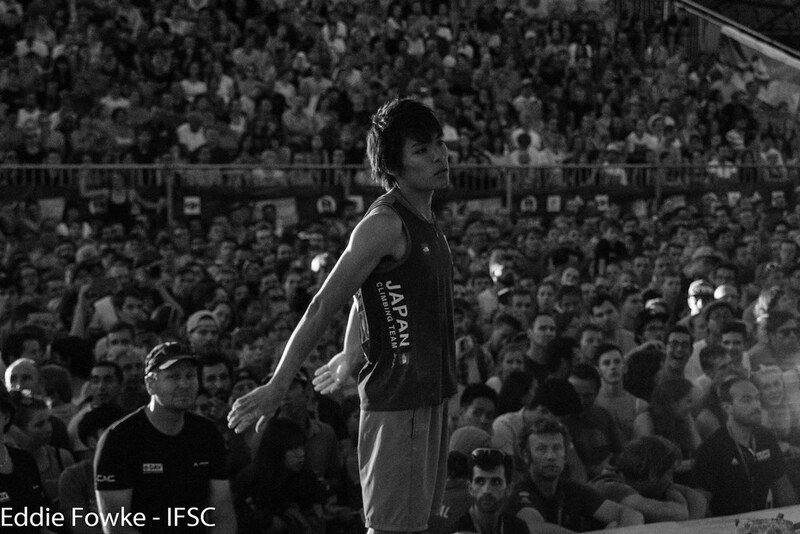 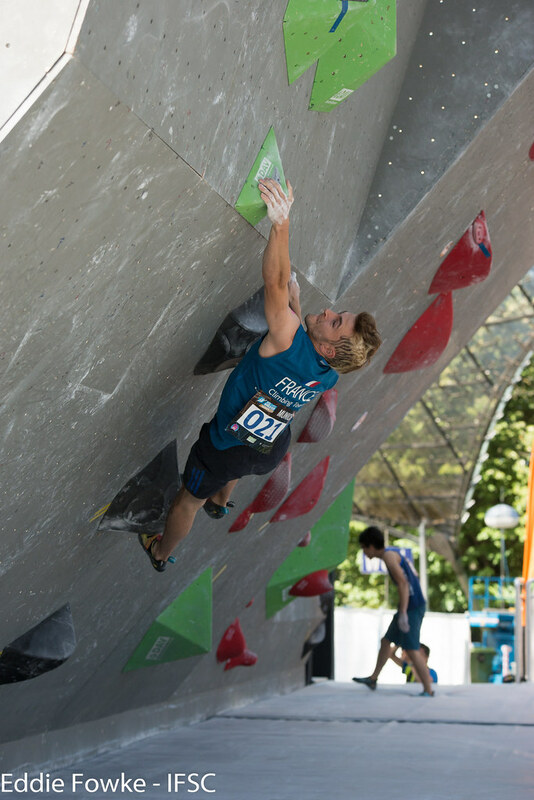 Narasaki needed to best teammate Kokoro Fujii to win the Overall, and the twenty-year-old did just that when Fujii missed out on qualifying for Finals by Top attempts. It was the first Overall victory of his career. With Narasaki's win, Alexey Rubtsov of Russia was forced to settle for third behind Fujii and 2015 champion Jongwon Chon of Korea could not make a second Overall podium. 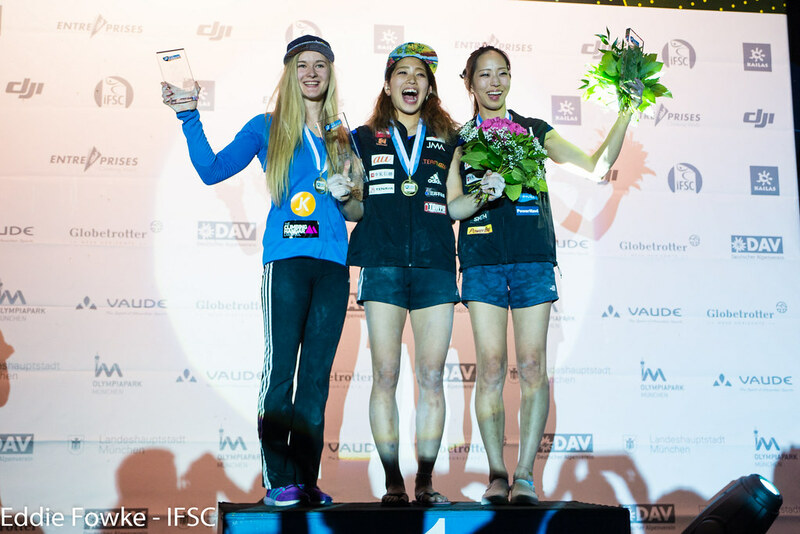 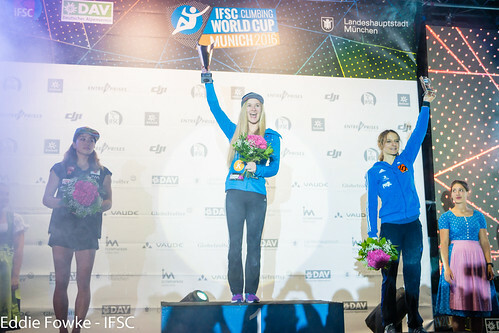 For the Women, Coxsey had already sealed the deal at the previous event in June, but Nonaka maintained second place with a victory in Munich to improve on her third-place finish last year. 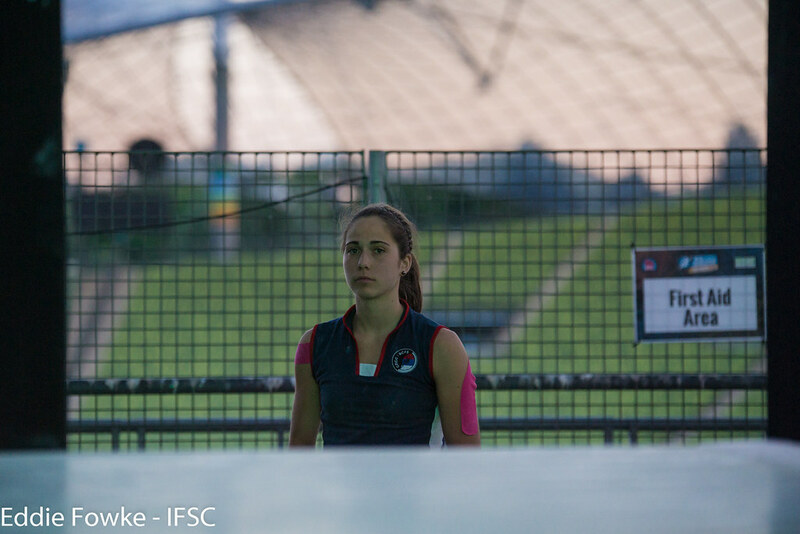 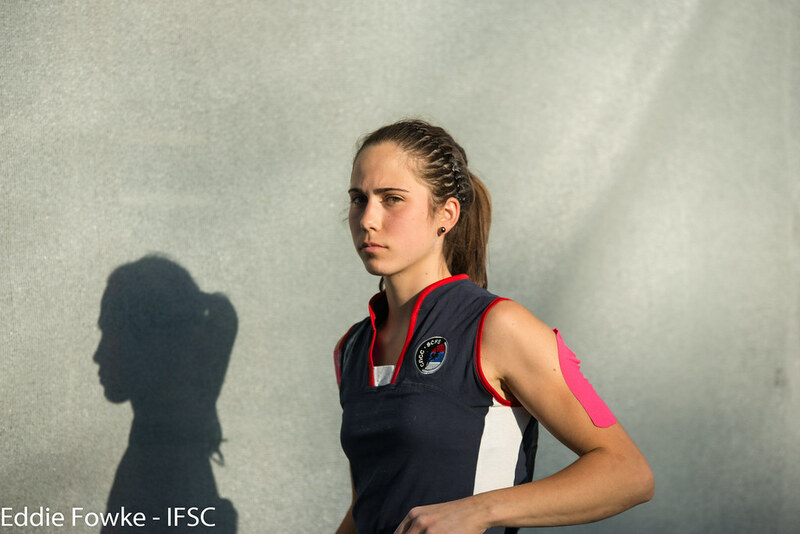 Despite falling just short to 2015 Overall champion Akiyo Noguchi of Japan in Finals, Melissa Le Neve of France still secured her first Overall medal with a strong Finals performance. 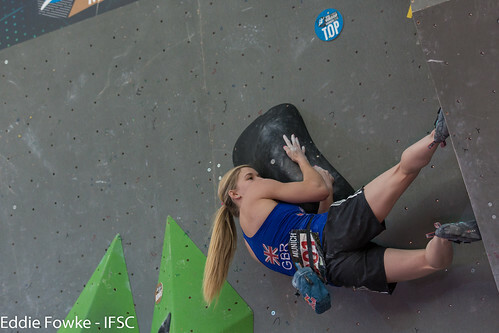 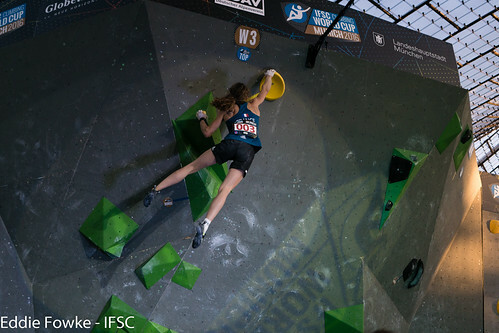 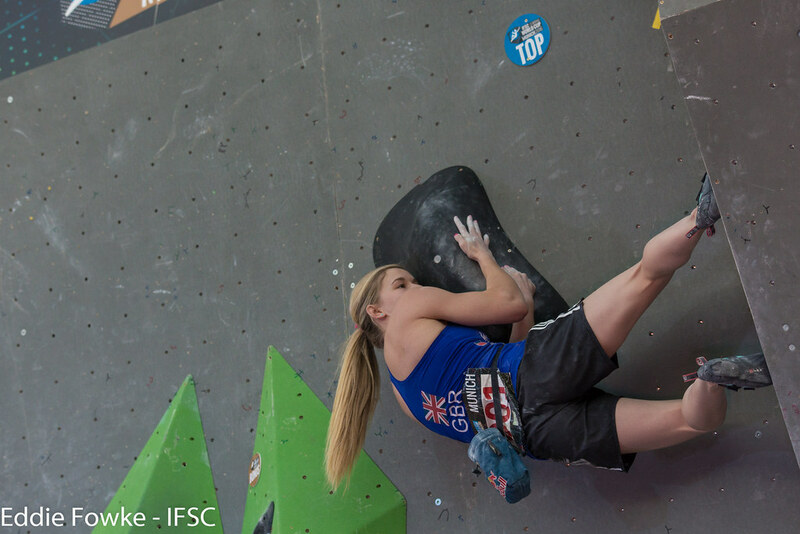 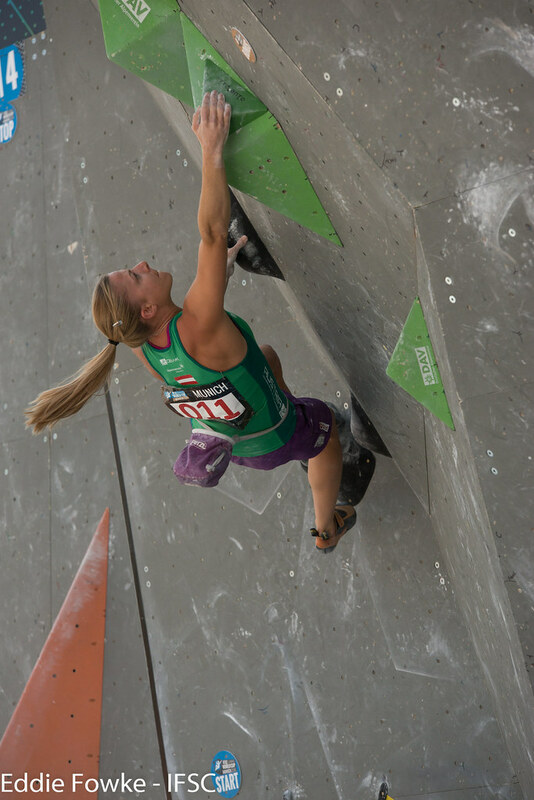 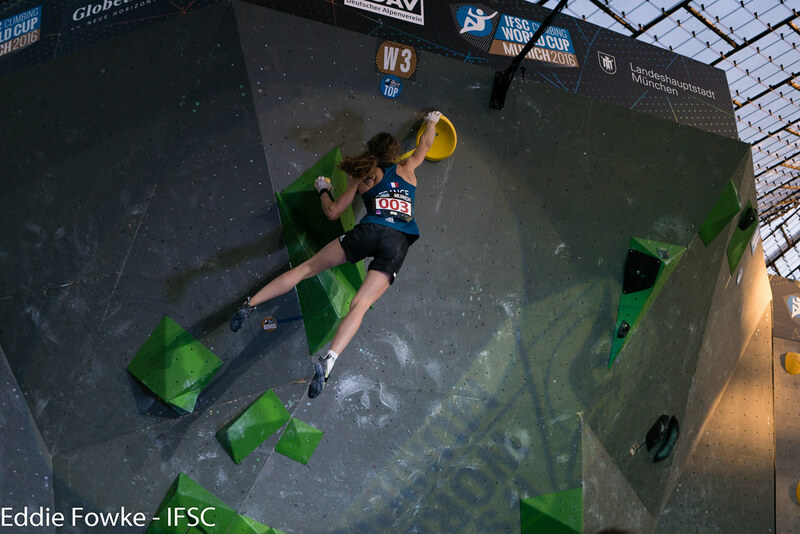 The first Women's problem (W1) did not factor into the equation when the feet of every athlete peeled off the bean-shaped volumes just before the Top. W2 required both strength and precision, and four Women solved the horizontal mantle to flash the problem. 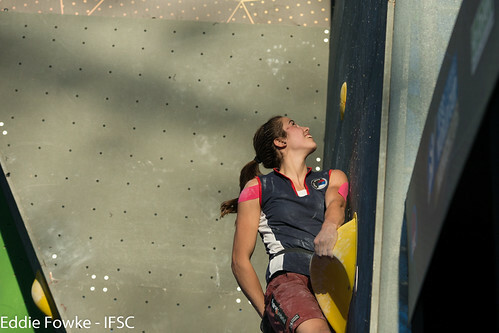 Five climbers powered through the triangular volumes of W3 to Top, but Le Neve required one more attempt to do so than her competitors. 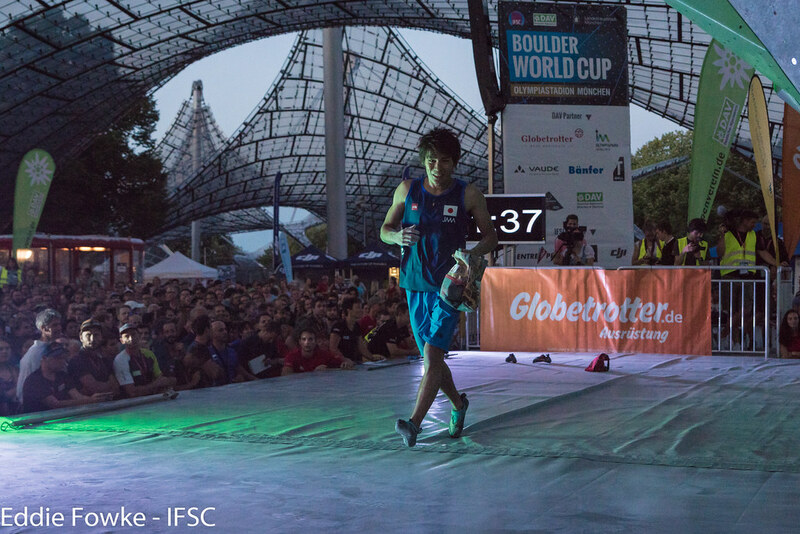 Heading into W4, Coxsey, Nonaka and Noguchi were tied with two flashes apiece and three bonus holds. Neither Coxsey nor Noguchi could solve the tricky slab start, and Coxsey bested the veteran only with a countback to Semis. 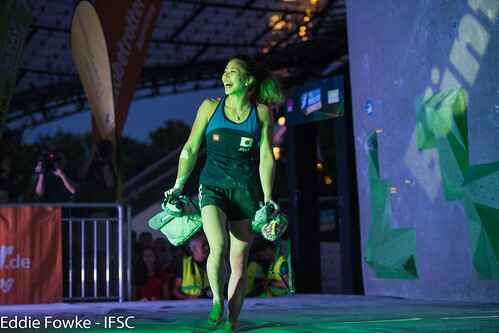 Despite having the Gold in the bag with a countback to Semis, Nonaka still found the bonus hold beyond the technical traverse and kept it together to Top and win outright. 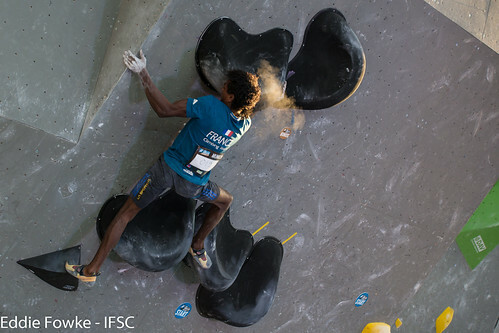 The first problem for the Men (M1) was powerful, but four athletes muscled up the monstrous blac volumes for flashes. Chon and Narasaki separated themselves from the pack with Tops on the technical M2. Narasaki further distinguished himself by maintaining his balance on the M3 slab, the only athlete to do so all the way to to Top. M4 boasted a crowd-pleasing combination of crimps and dynos. 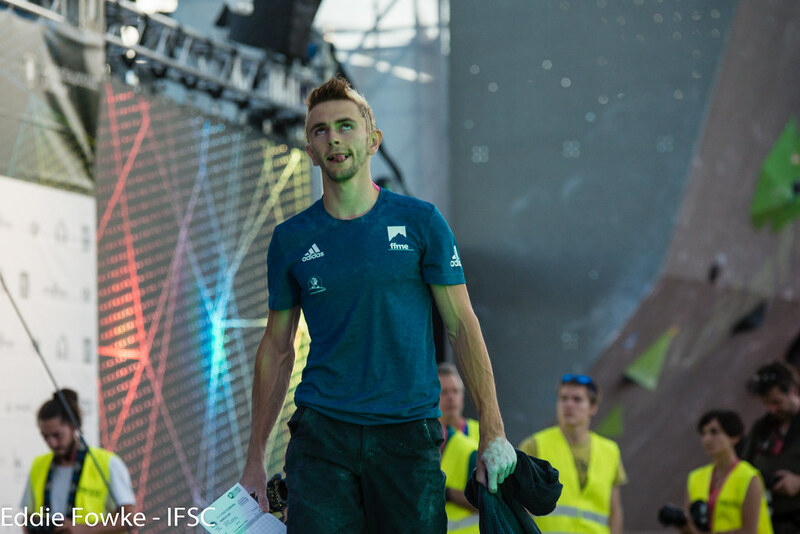 David Firnenburg sent the problem in two goes for his home crowd, but the German was surpassed by Rubtsov who, after making multiple problems look easy this weekend, got the flash he needed for Bronze. Although Chon also snagged the final hold, he did not do so in few enough attempts to surpass Narasaki, who later found his fourth Top of the round anyways.